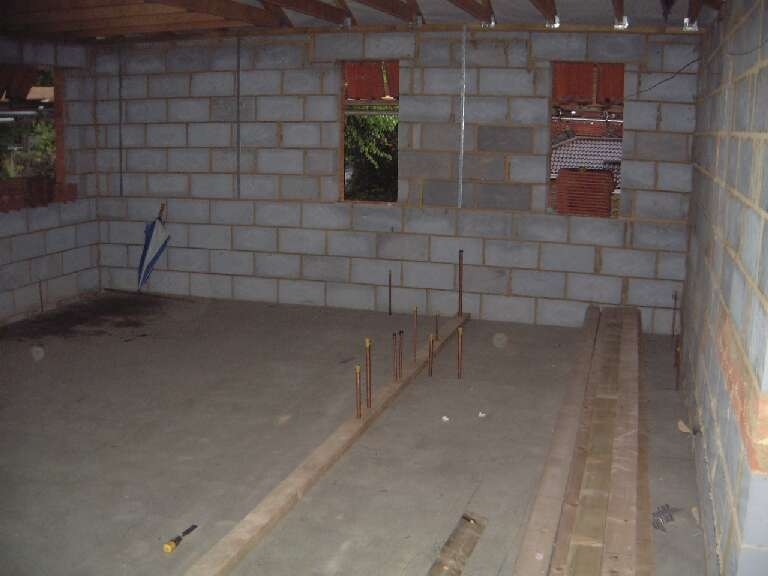 Day 36 – 07-05-03 Sunny. 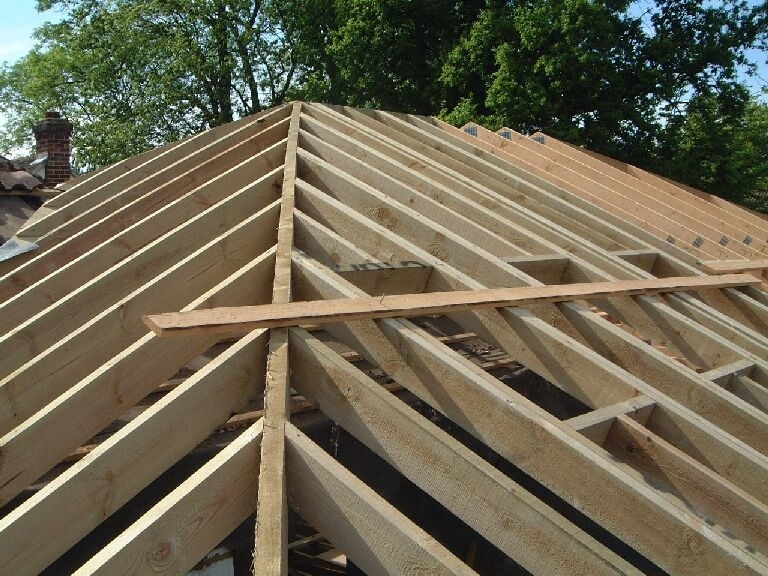 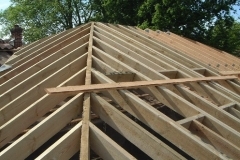 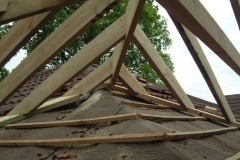 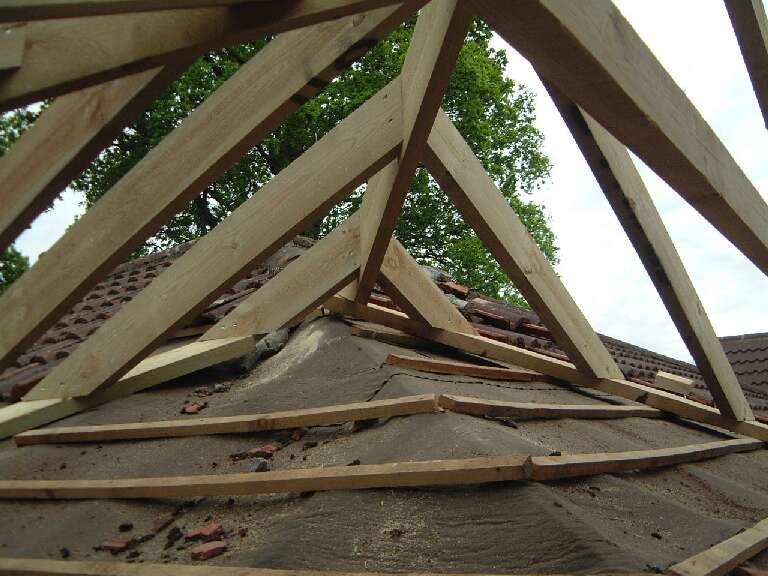 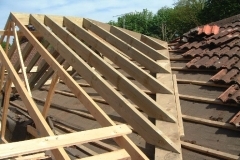 Roof work continued well and is ready for the inspector tomorrow. 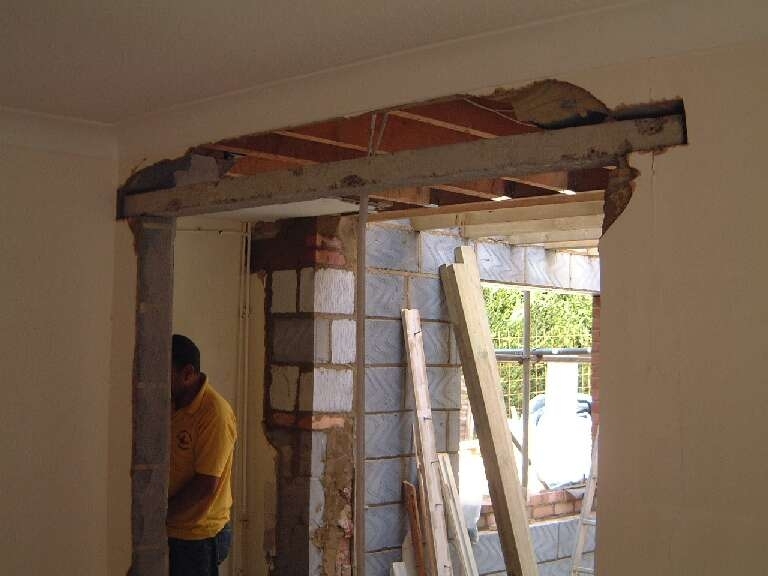 Bill managed to cut through the steel lintel which was quite a challenge and very heavy. 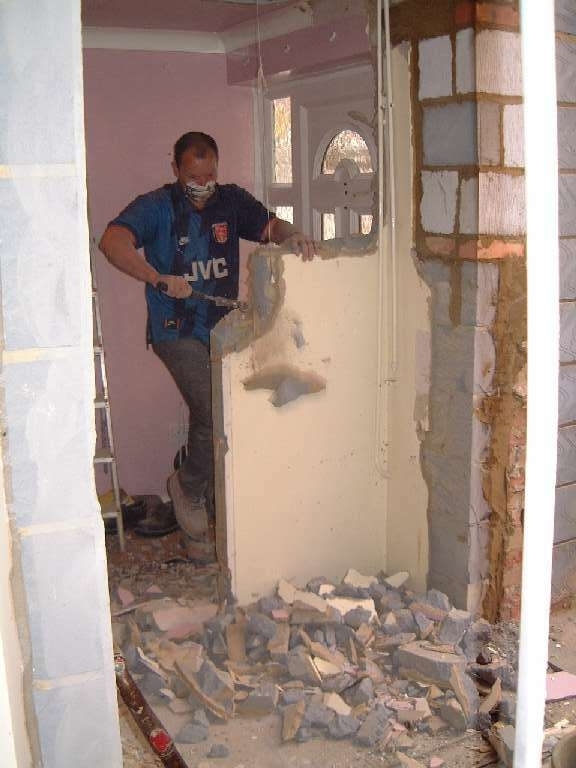 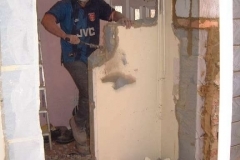 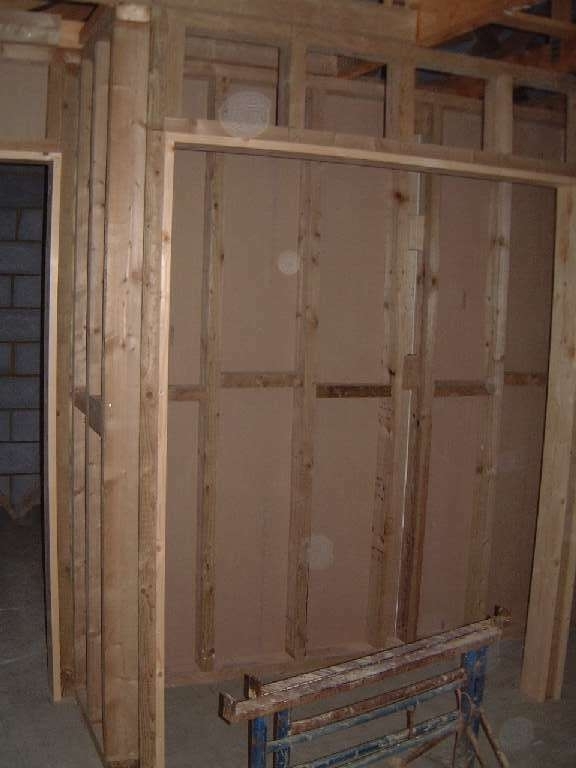 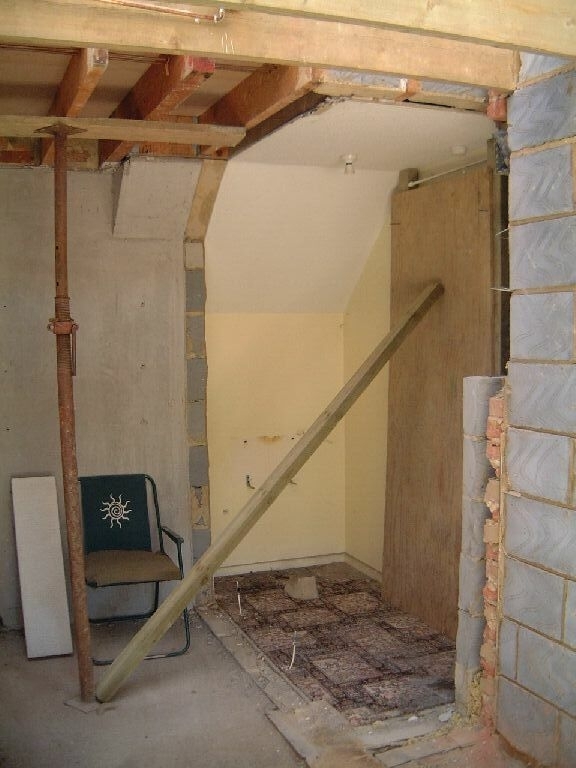 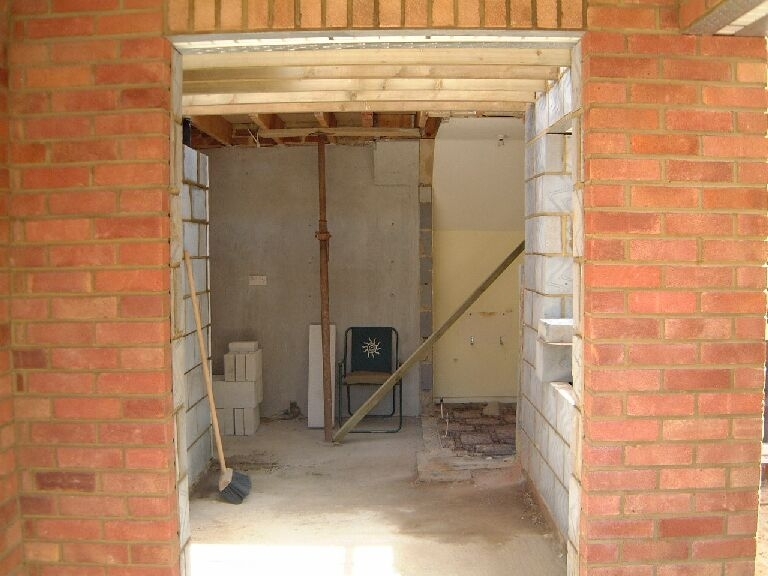 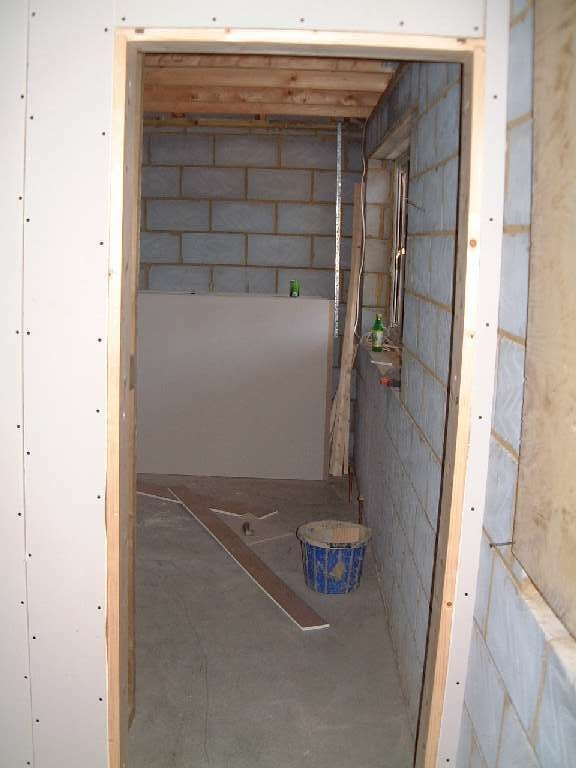 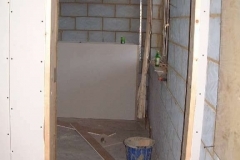 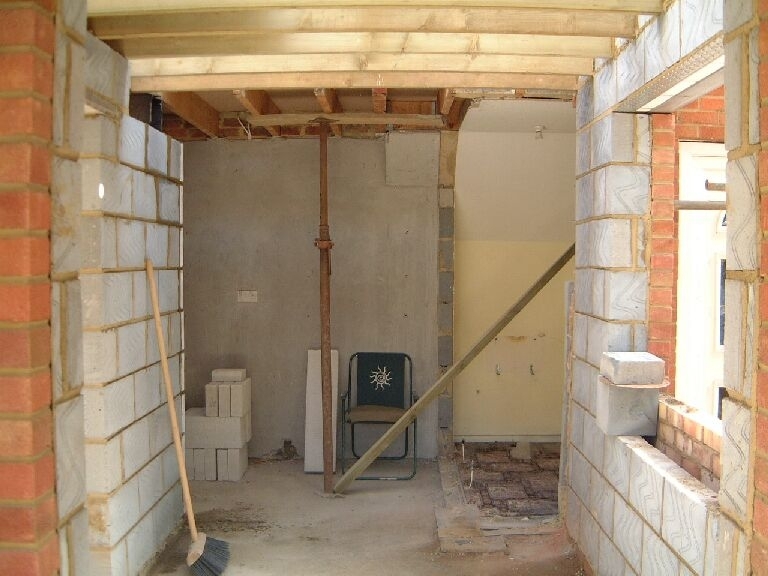 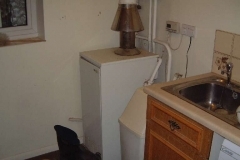 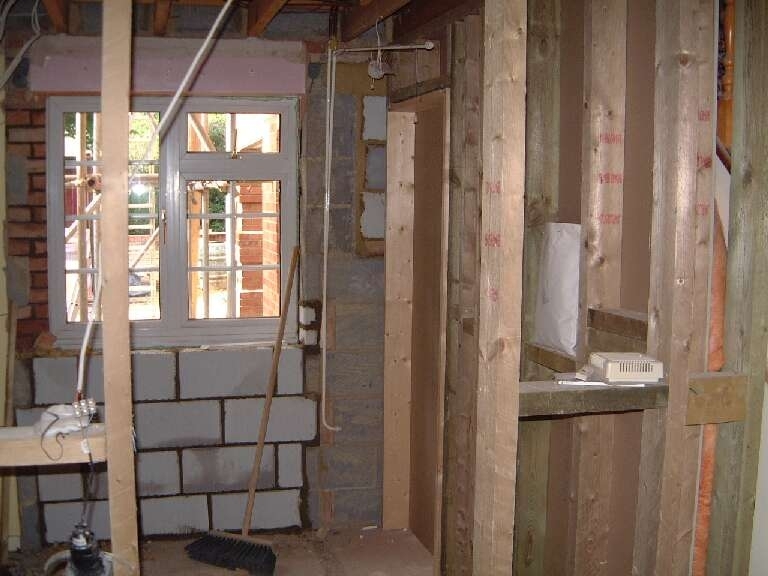 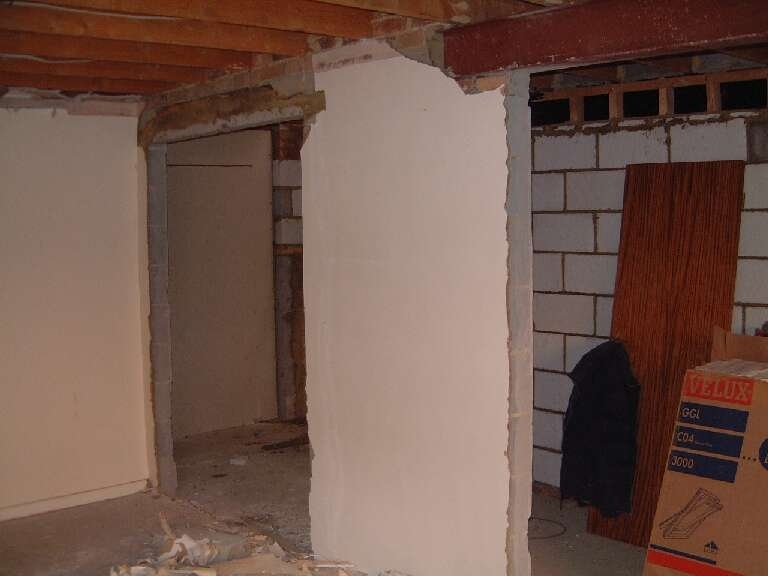 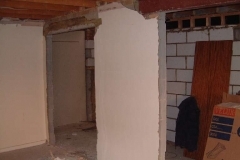 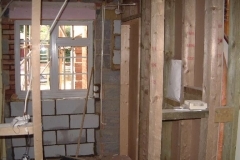 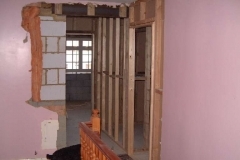 The original downstairs toilet wall was demolished and both the toilet and the sink thrown into the skip. 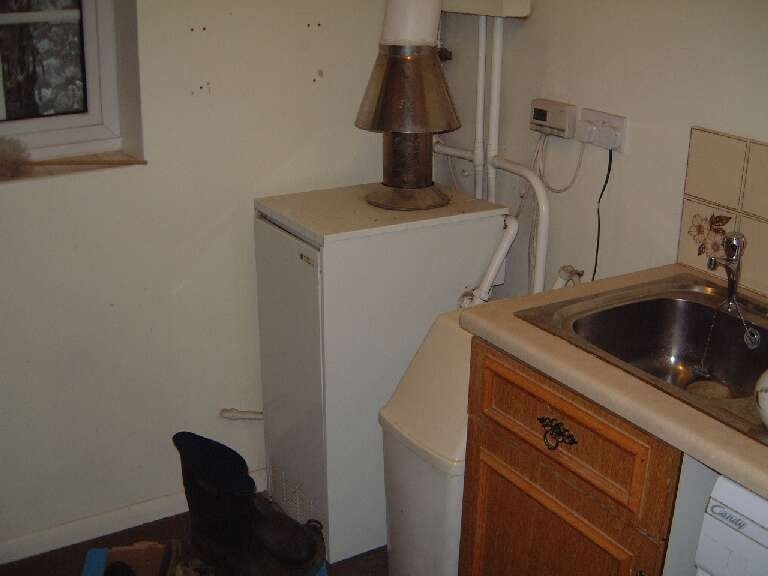 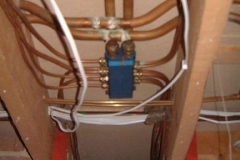 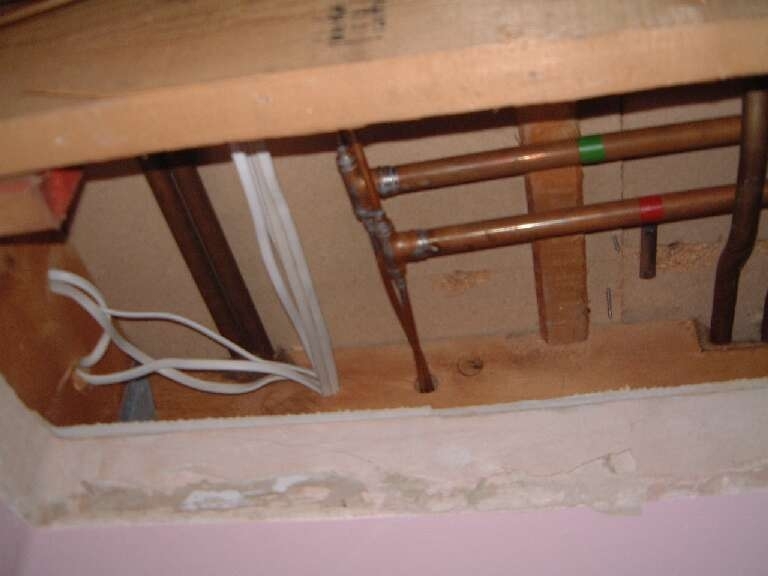 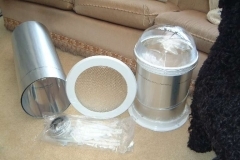 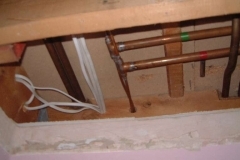 The hot, cold and radiator pipes were capped. 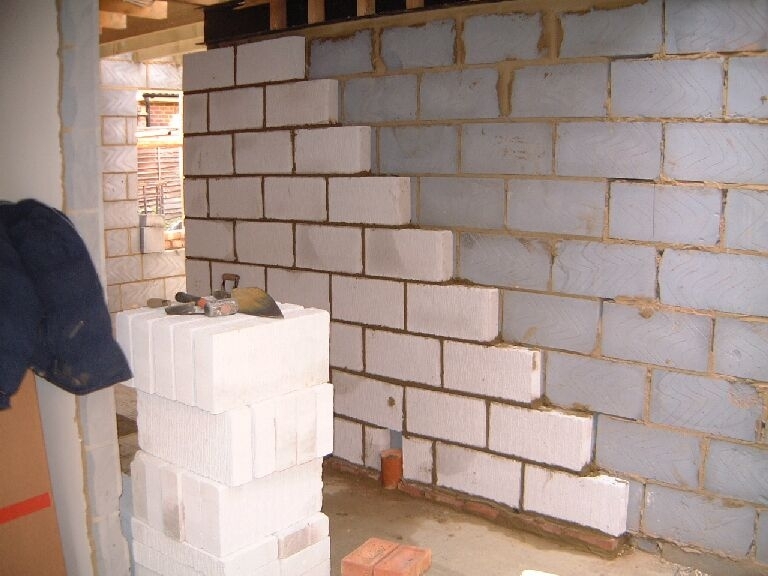 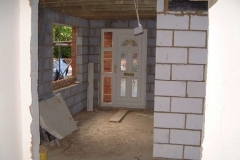 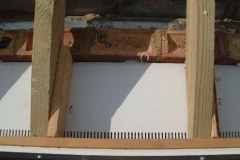 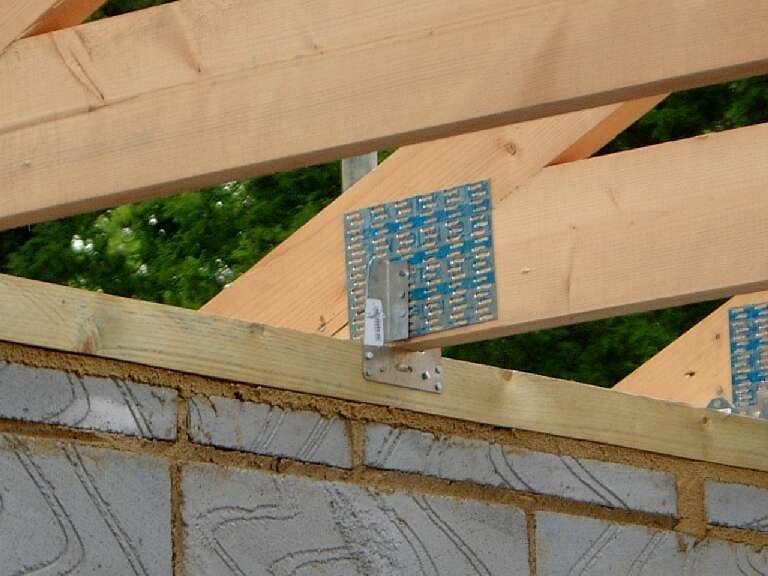 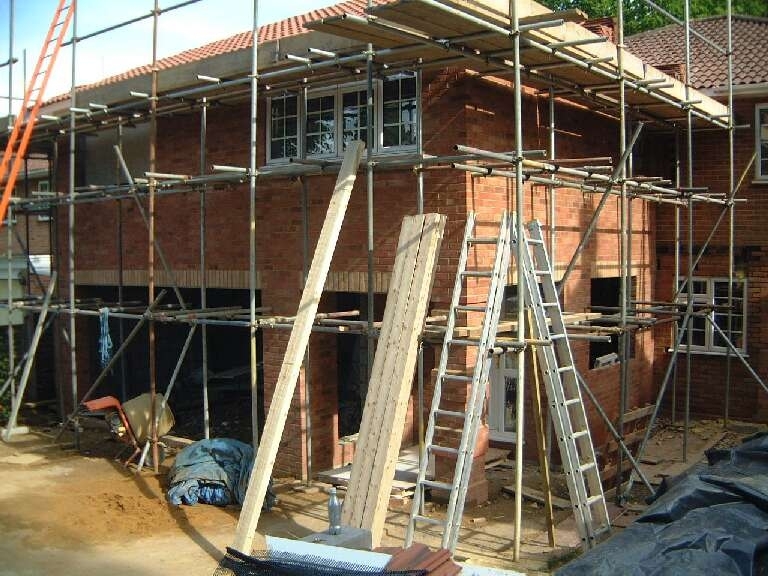 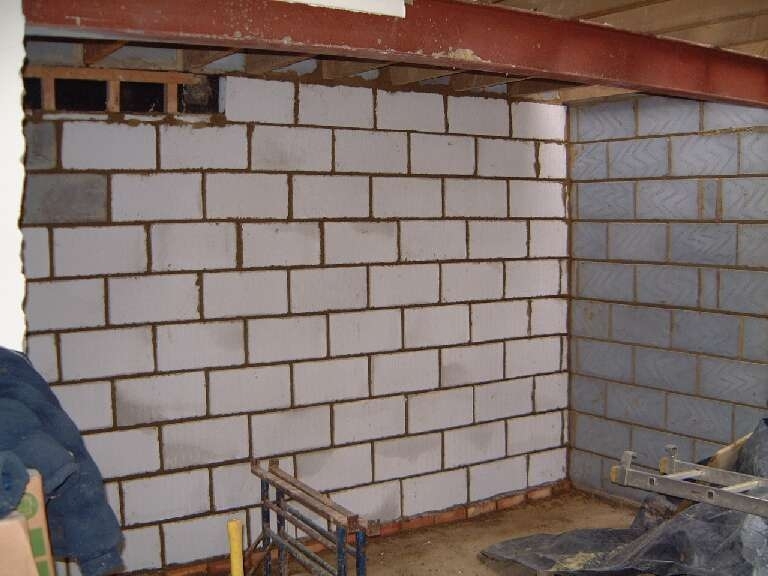 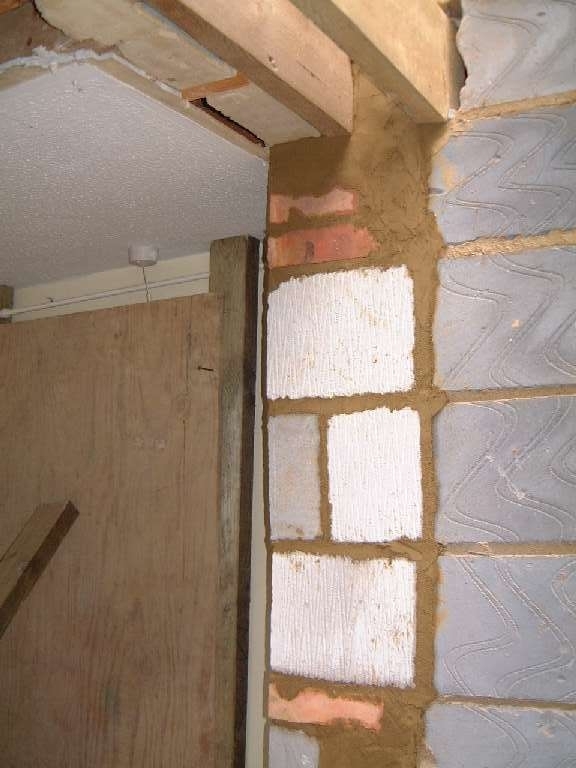 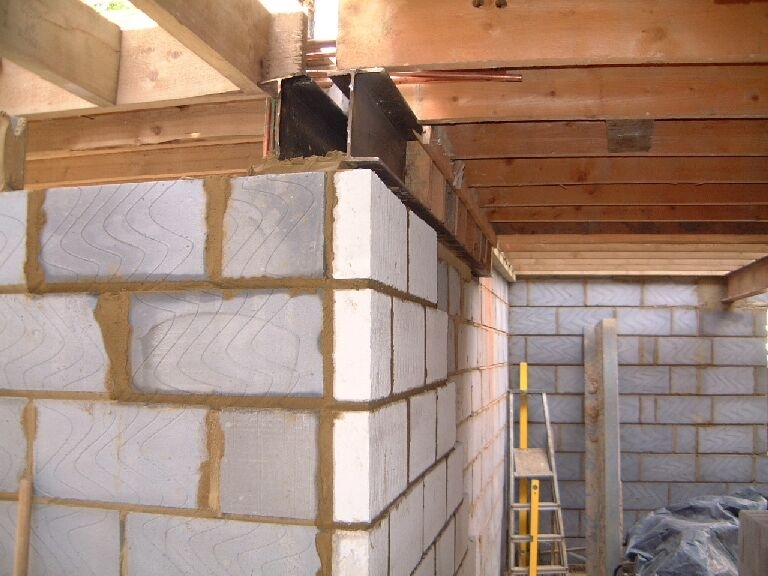 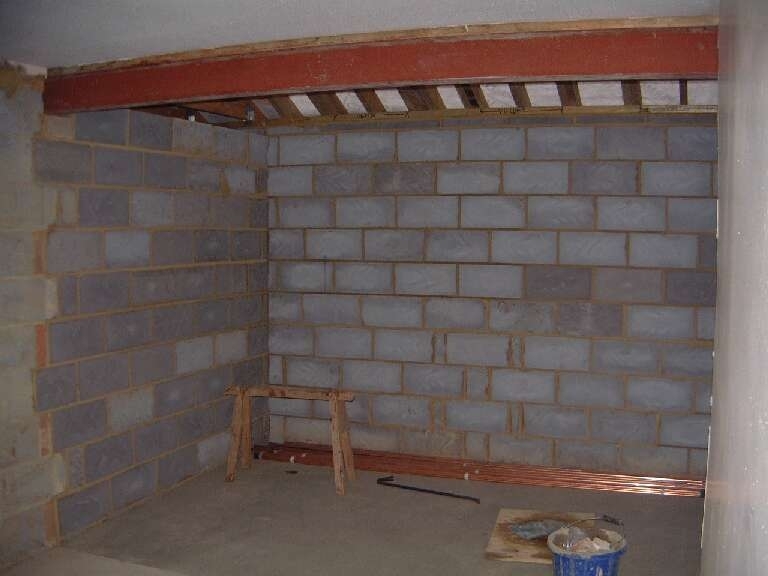 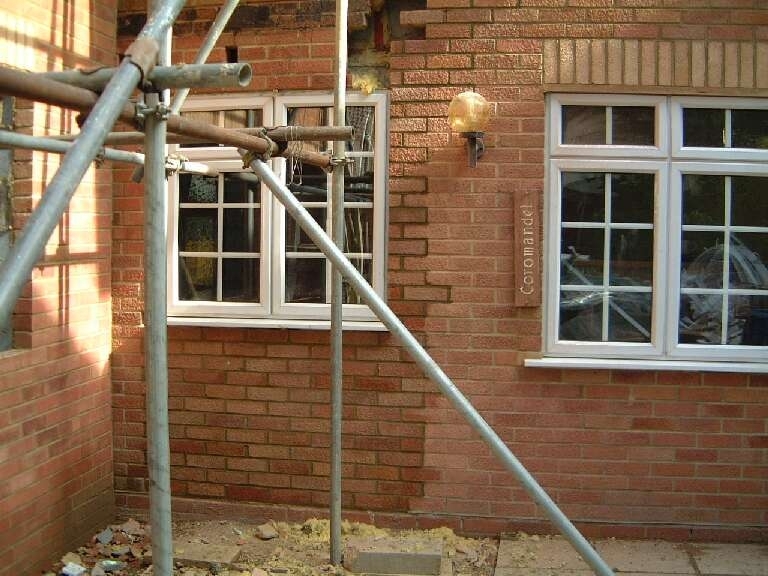 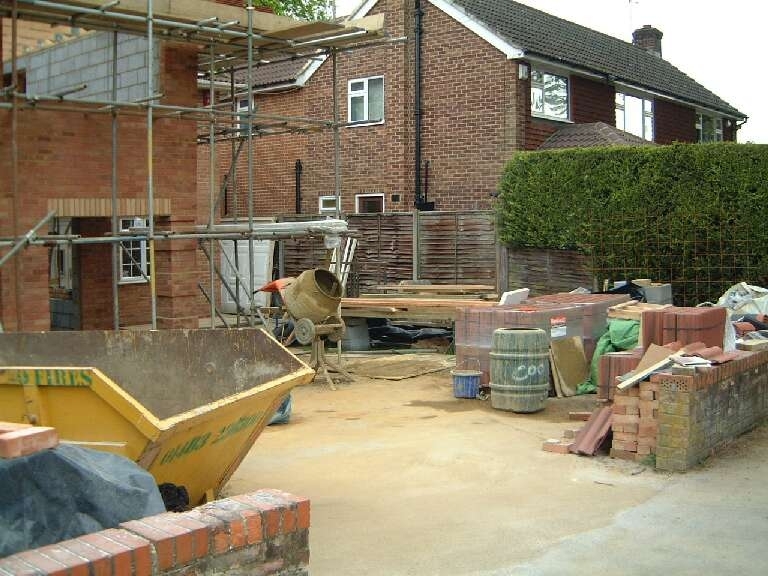 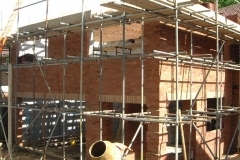 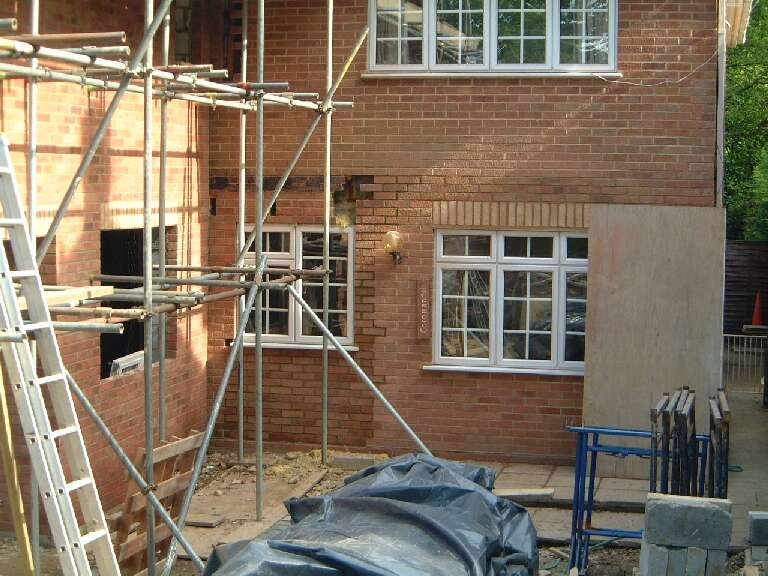 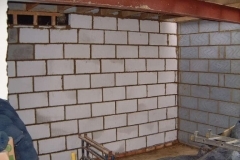 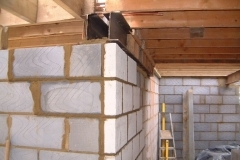 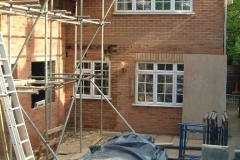 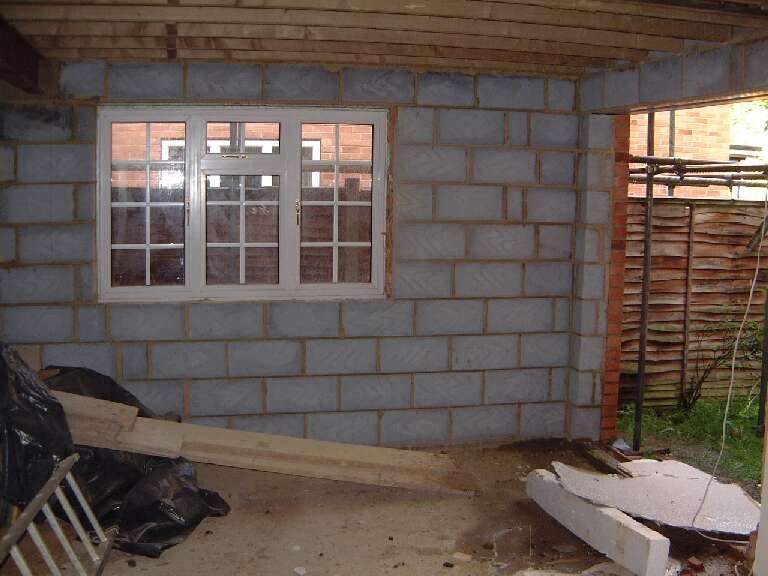 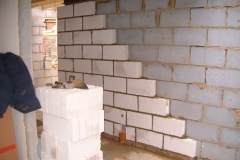 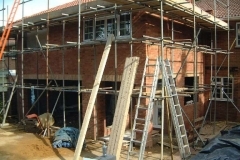 Extra blockwork was being built up to support the steel lintel. 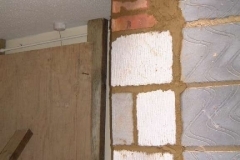 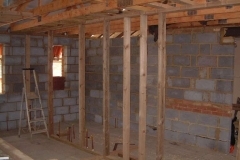 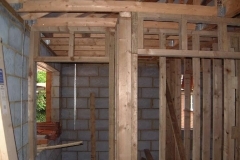 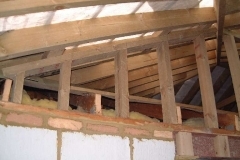 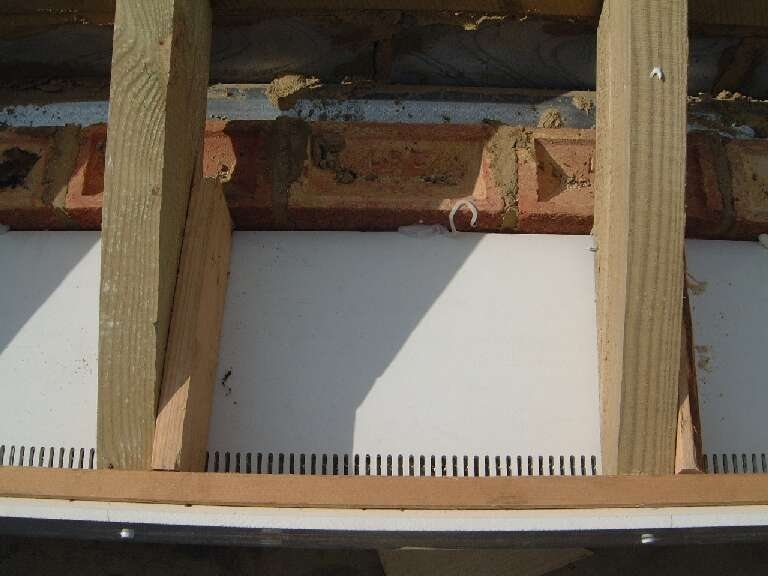 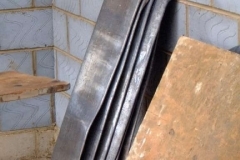 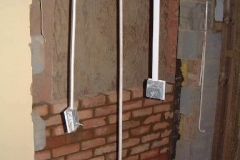 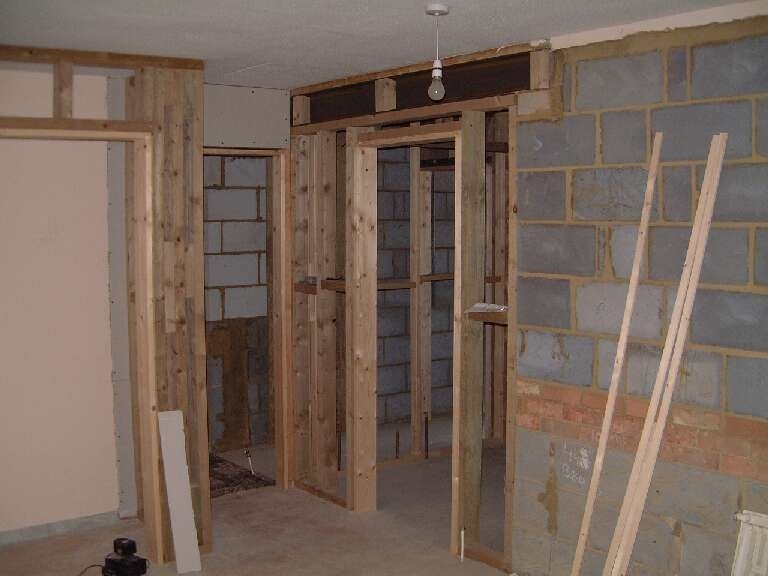 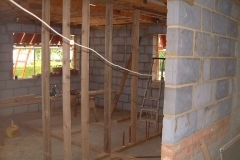 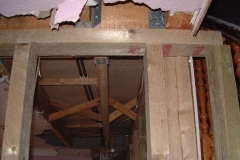 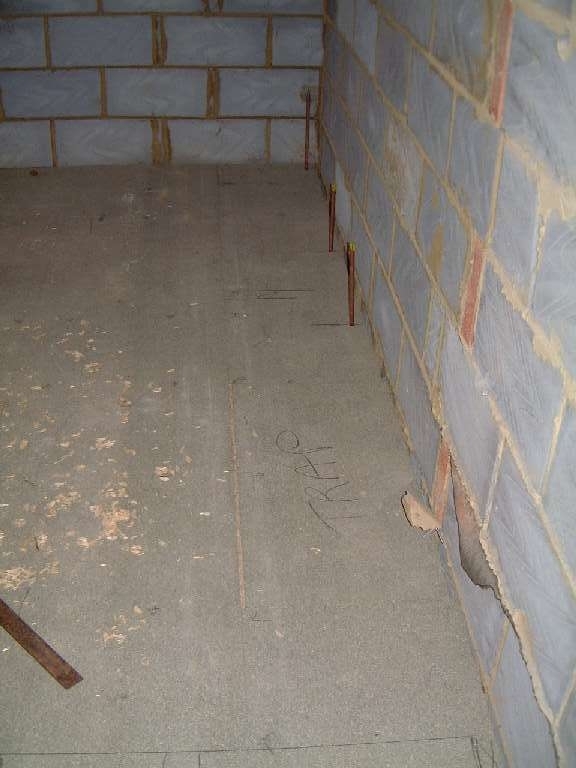 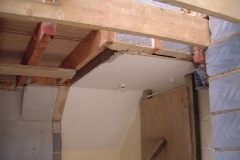 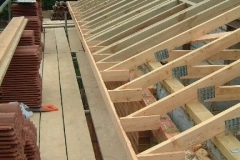 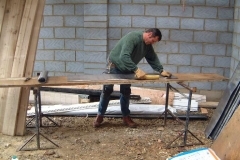 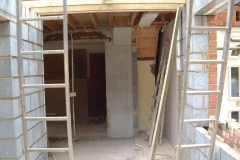 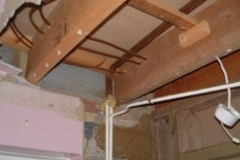 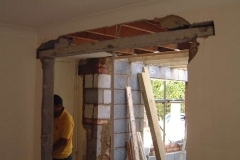 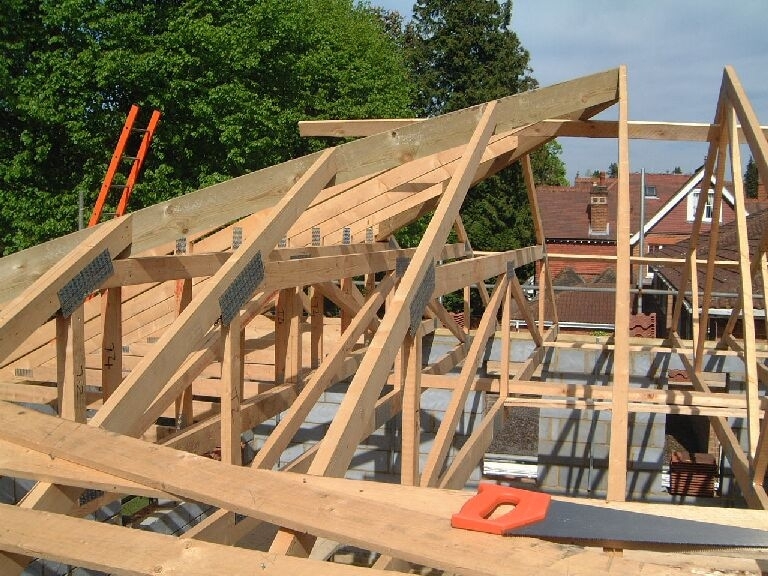 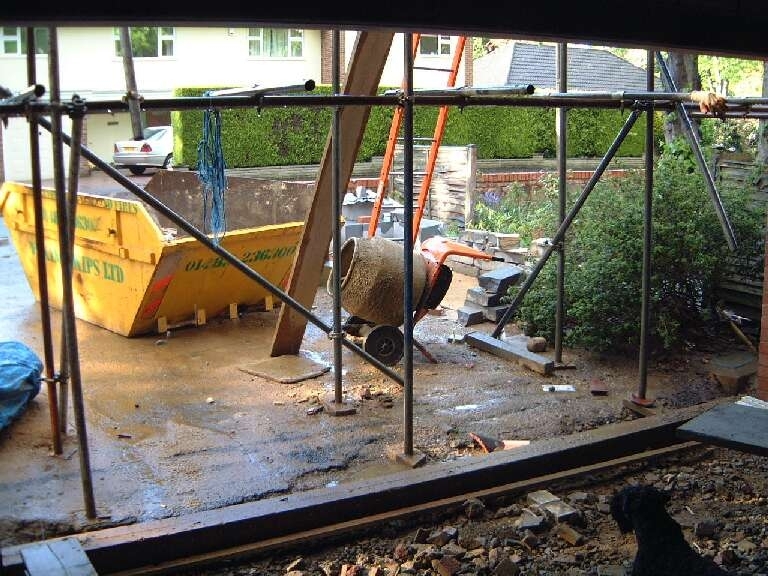 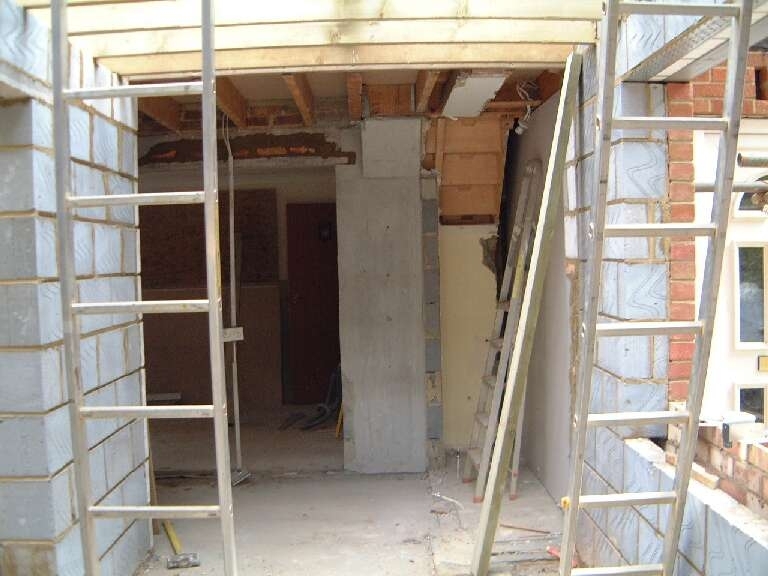 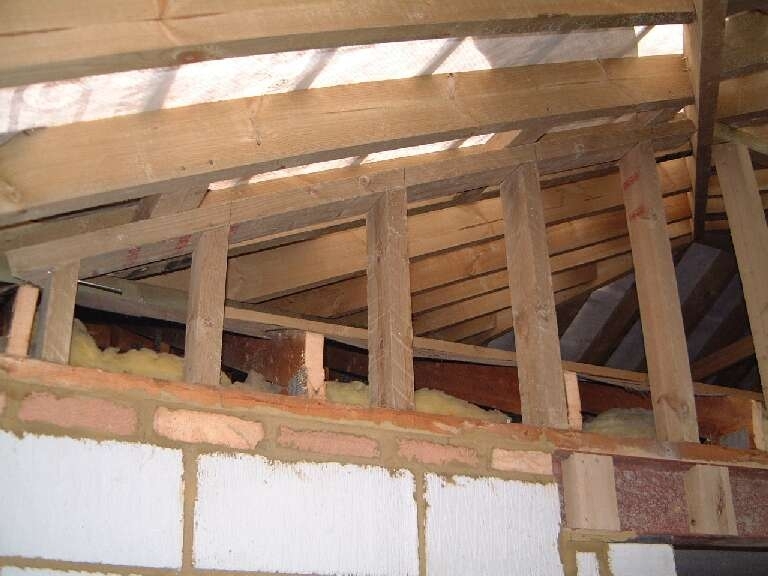 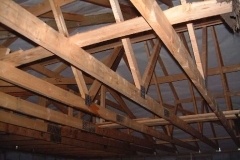 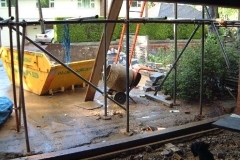 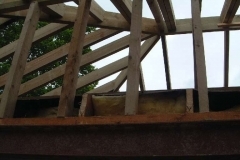 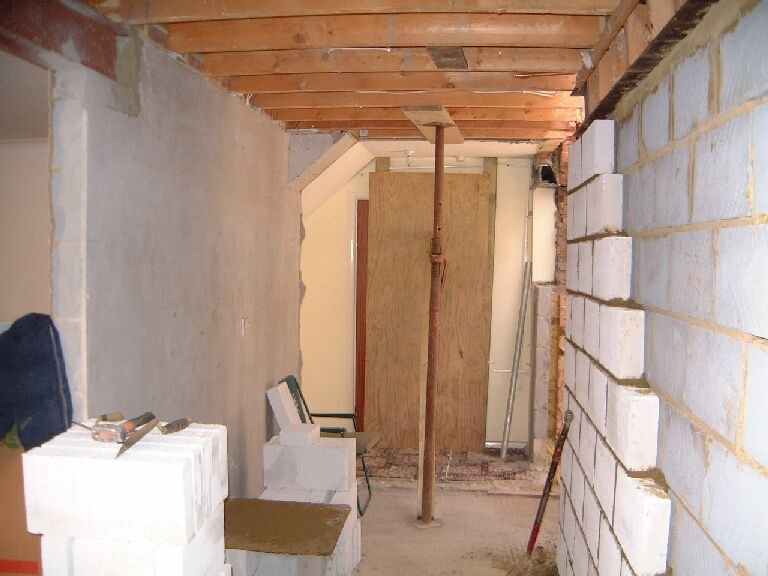 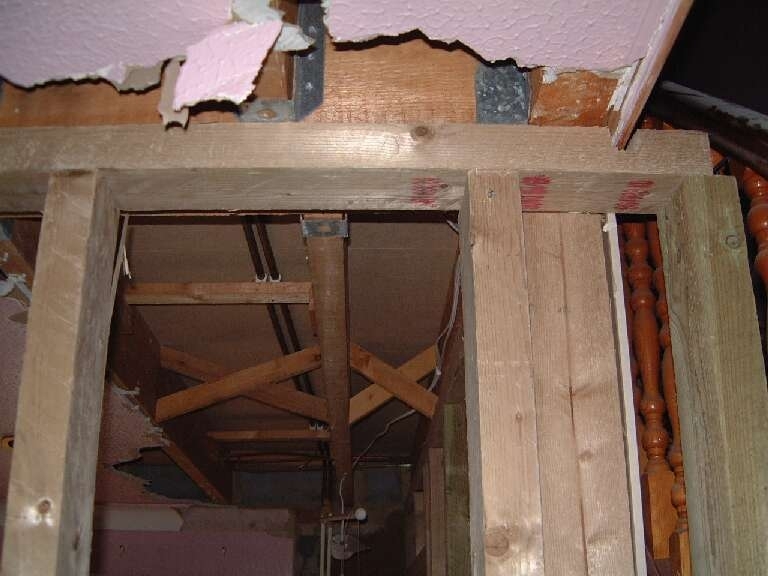 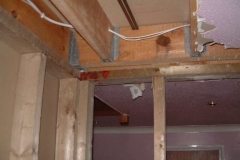 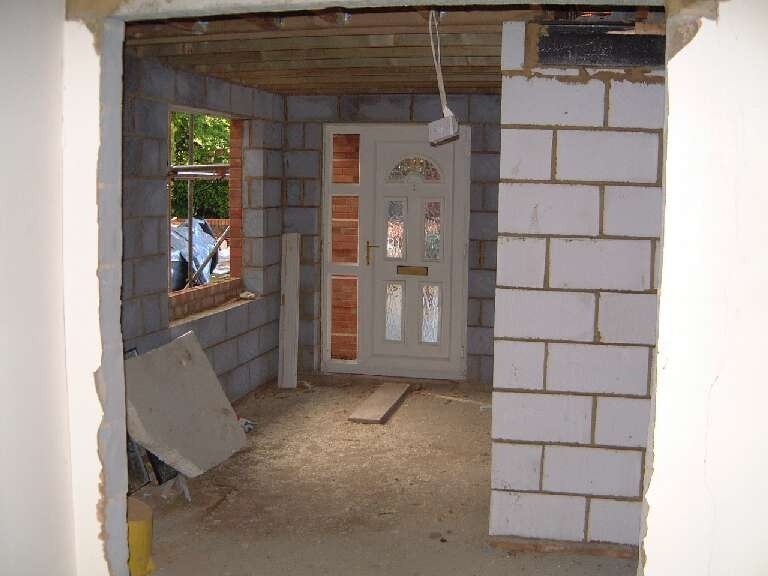 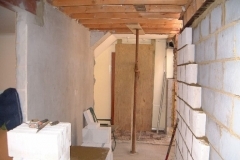 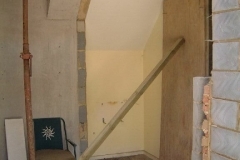 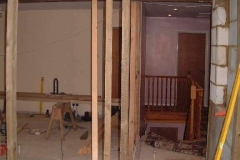 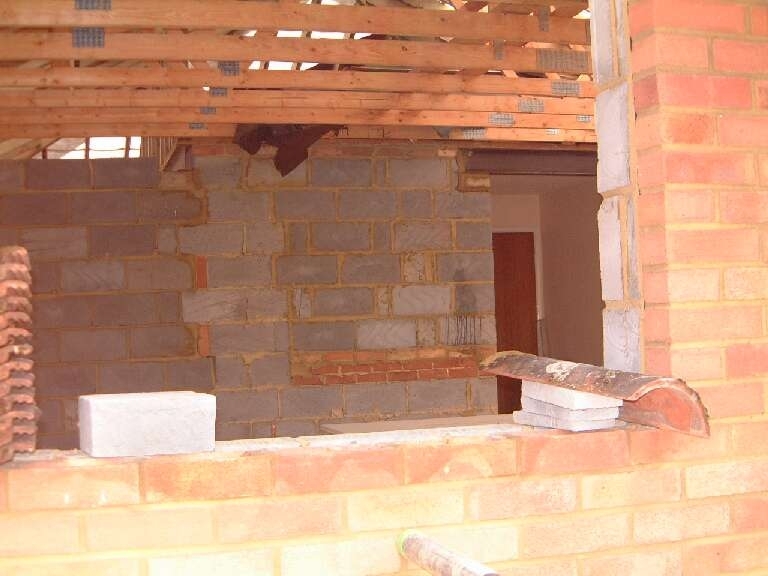 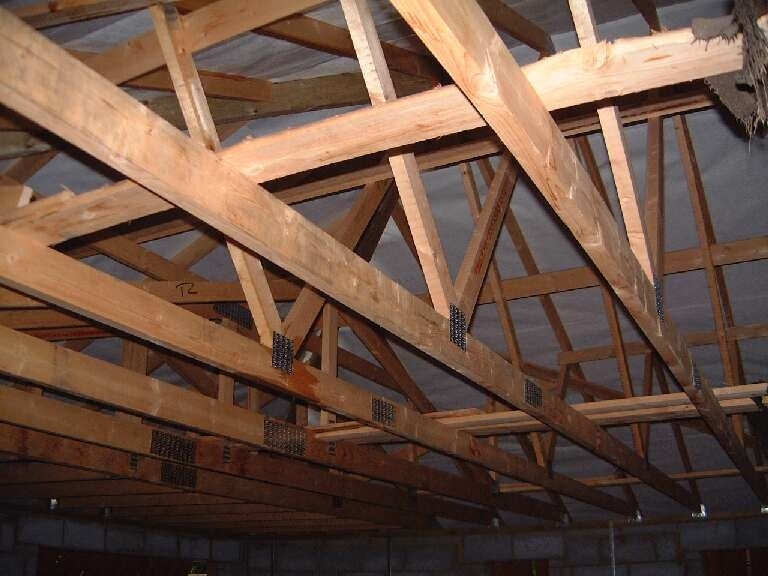 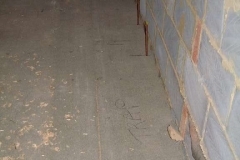 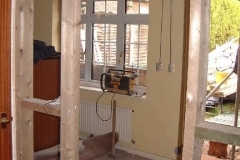 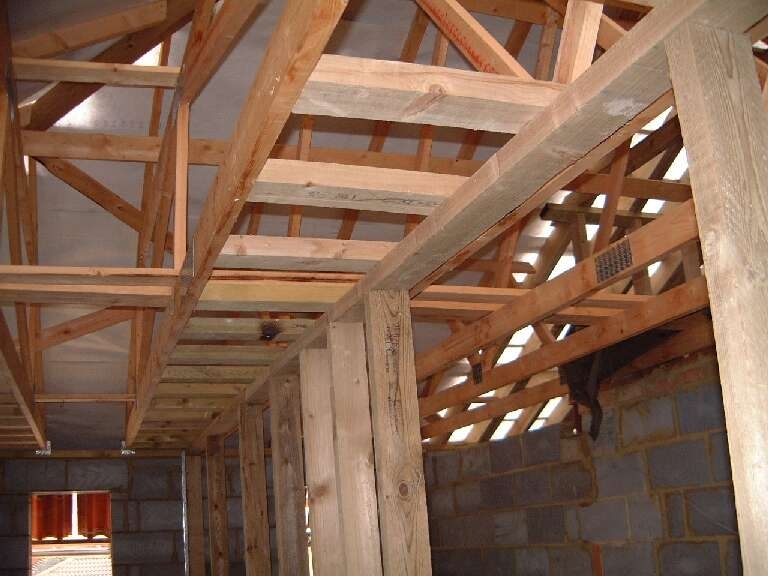 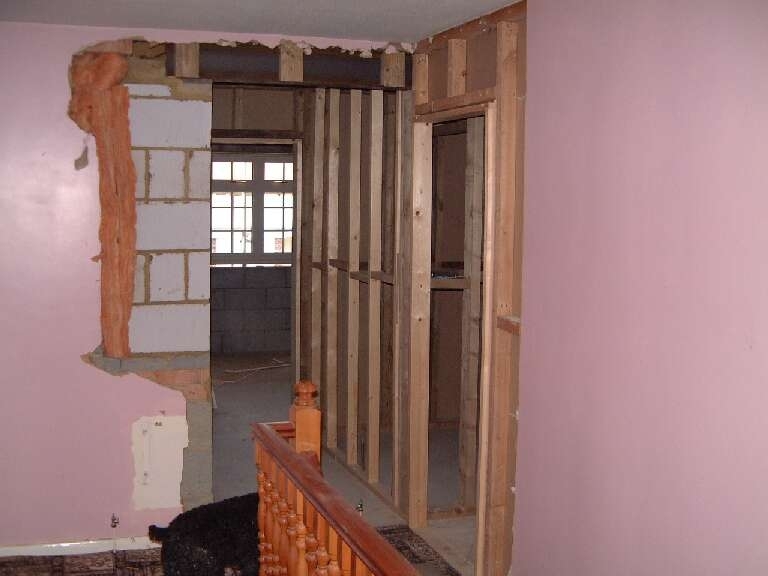 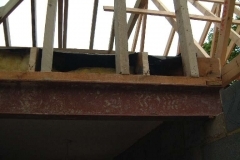 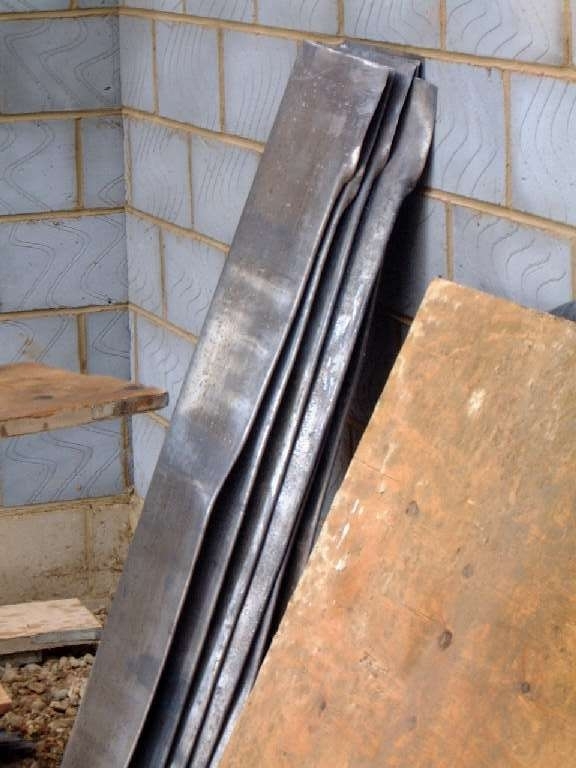 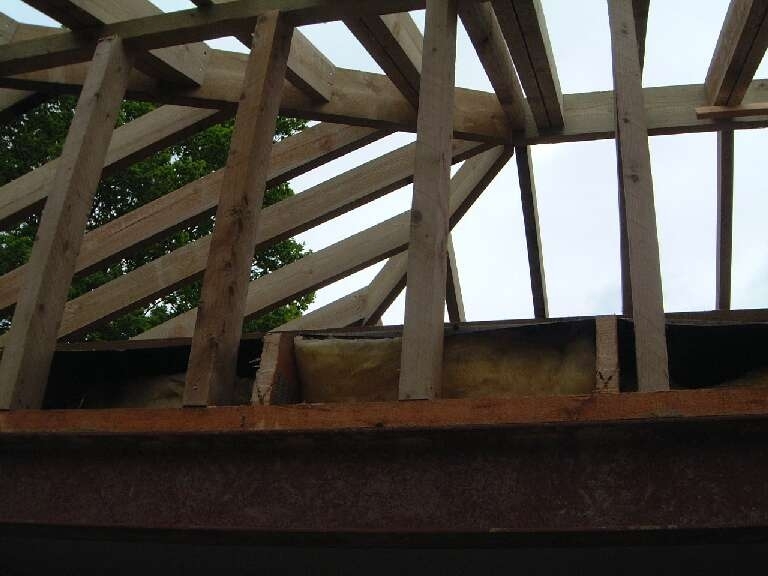 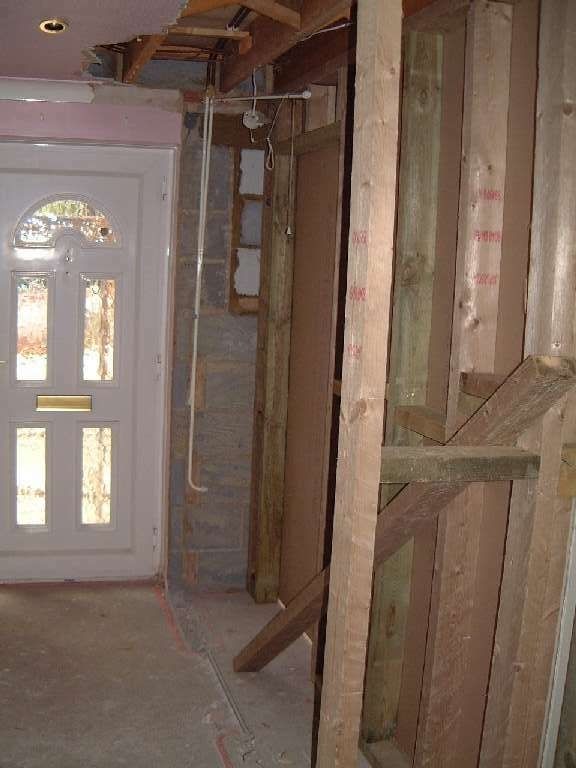 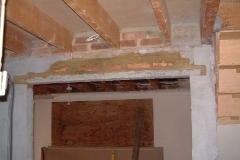 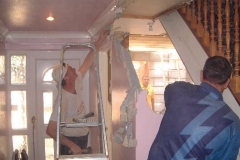 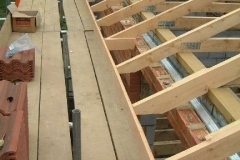 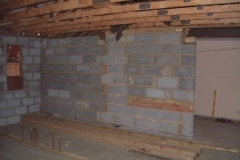 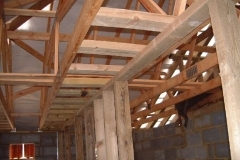 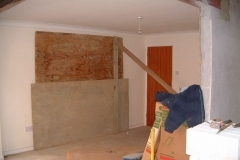 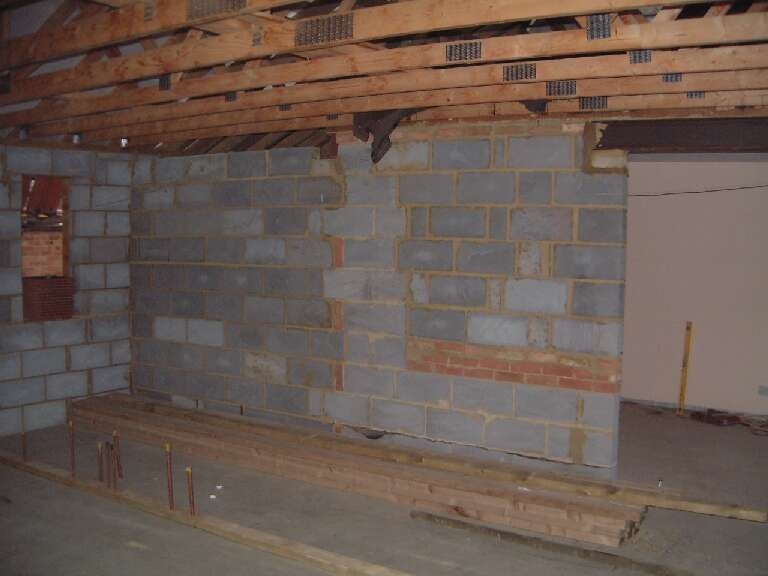 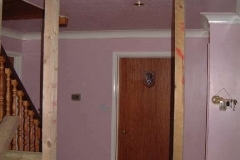 Although the lintel was removed, the existing beams will still need to be supported and will probably require a new lintel that will show in the hall. 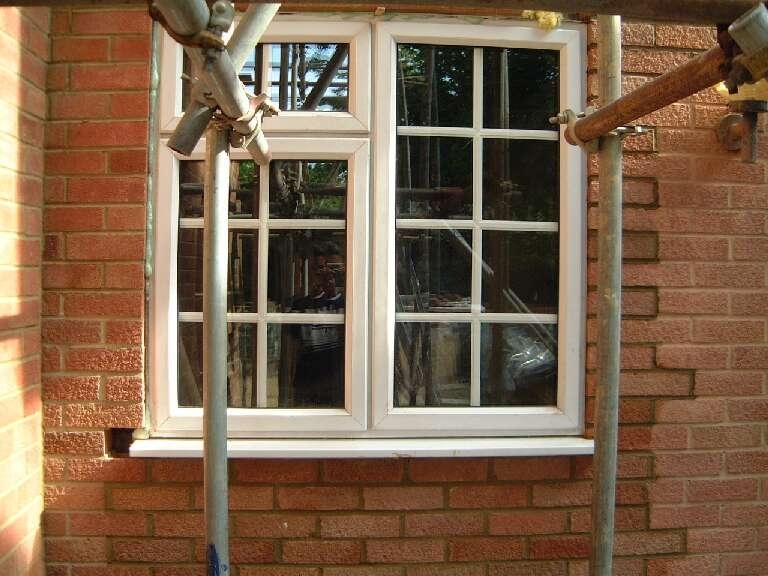 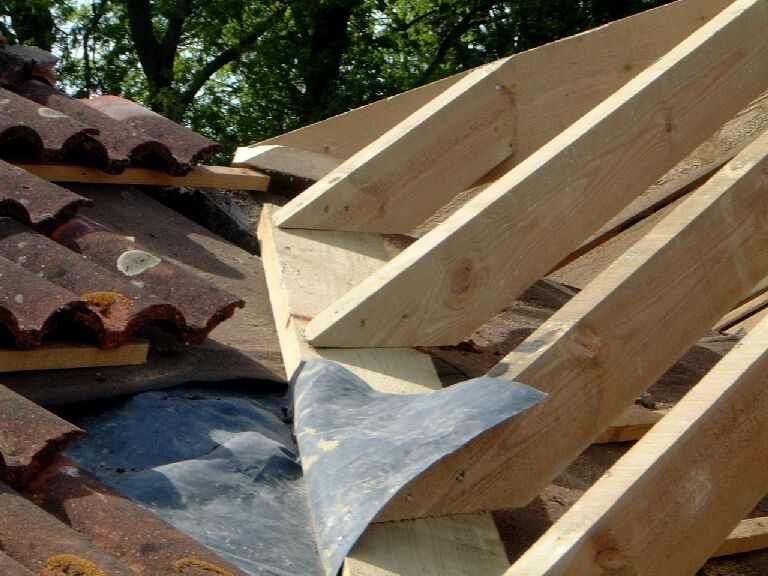 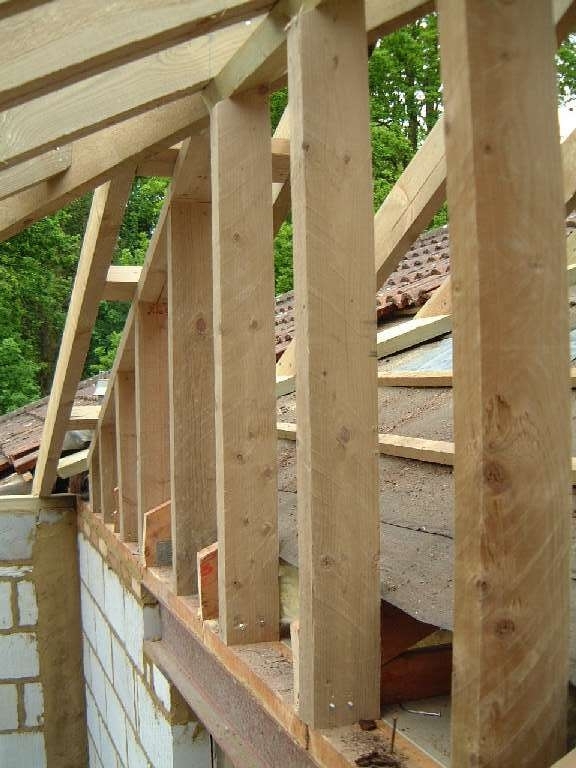 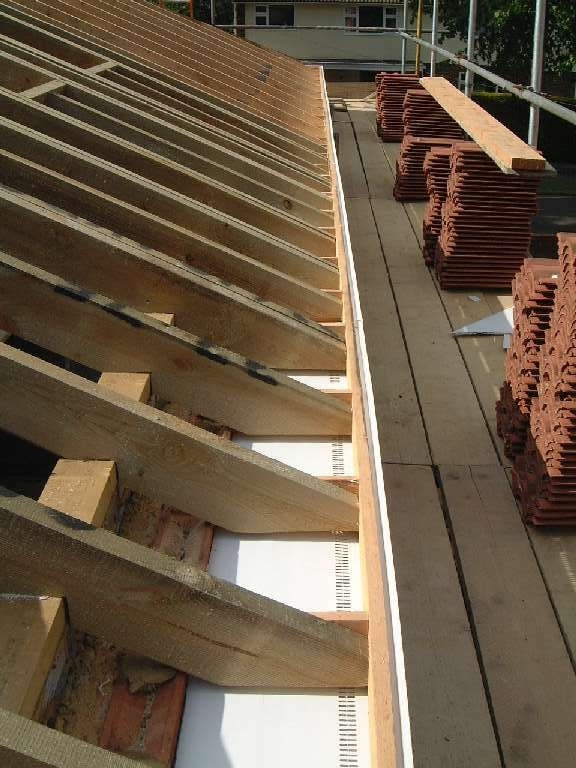 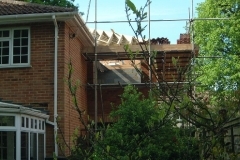 Bill feels that it is going to be very difficult to get a soffit to match our existing Anglian (double glazing) ones. 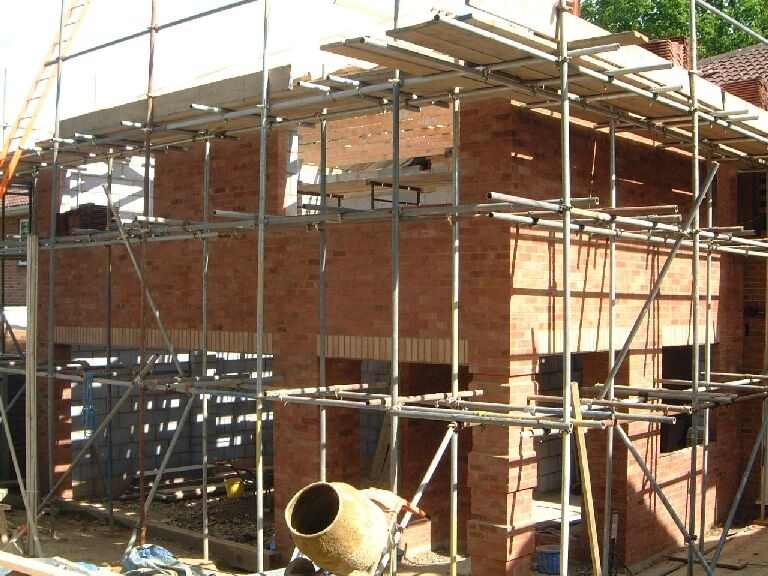 Day 37 – 08-05-03 Warm & sunny. 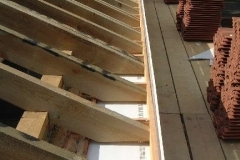 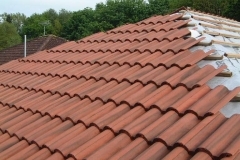 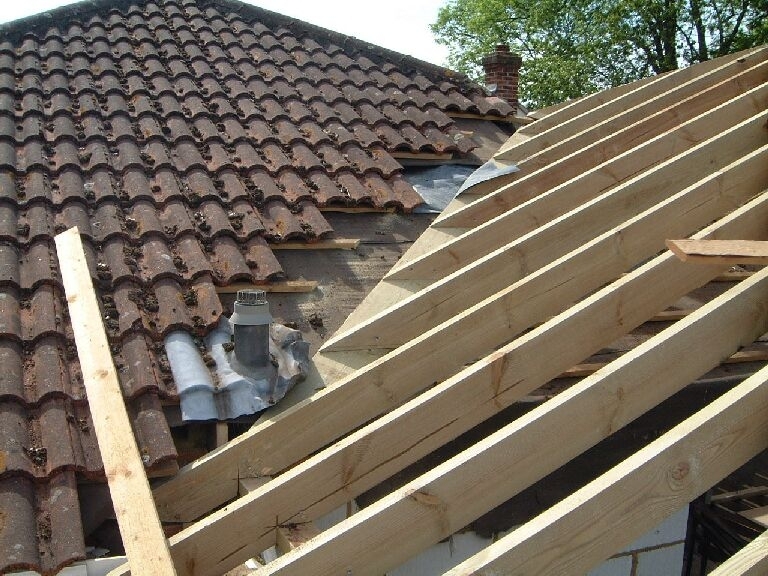 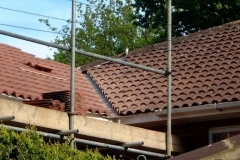 Bill went out in search of soffits & gutters, after some checking, Anglian were prepared to sell fascia’s and gutter shield to match our existing and at a reasonable price (shield = 30M at £117.65 ex vat and fascia = 30M at £94.98 ex vat) other materials were from Angel Plastics in Sutton. 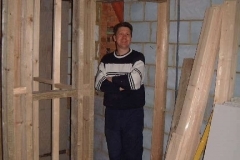 The building inspector checked everything and the only major concern is that Jim (the architect) has still not submitted calculations for the cathedral roof. 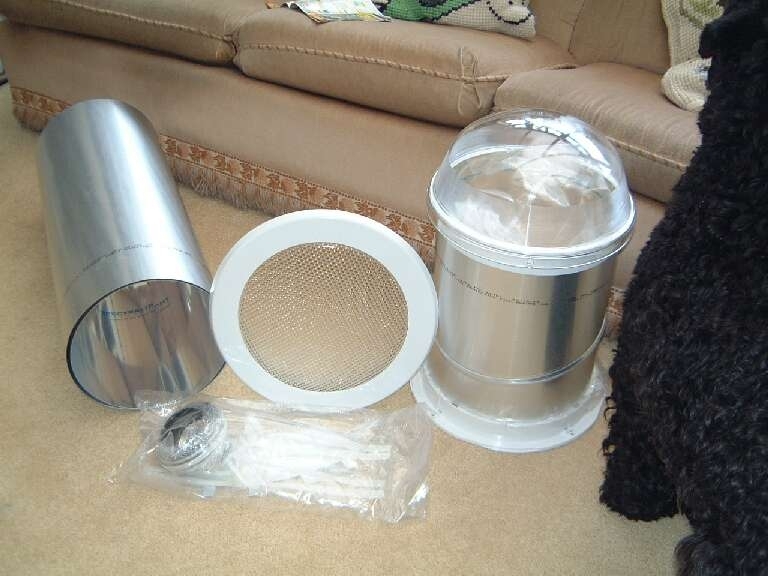 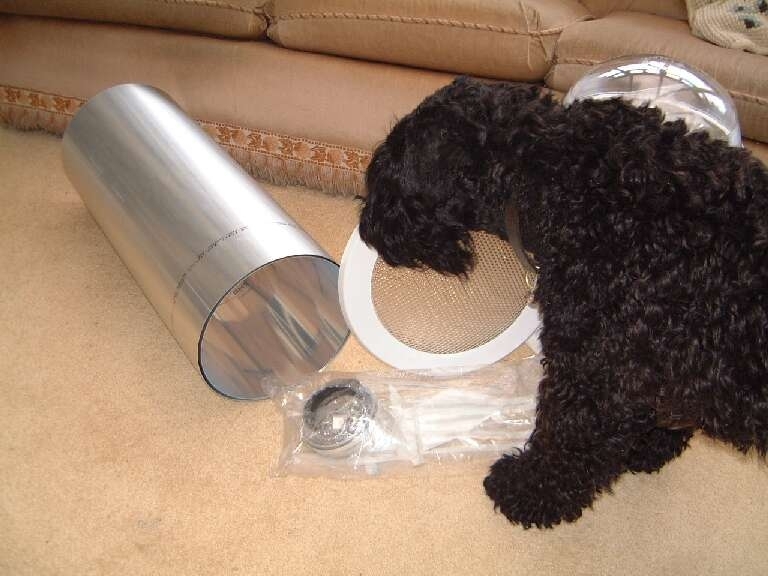 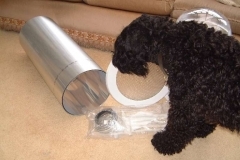 The solar tubes arrived and our first impressions are that they are quite large. 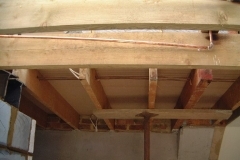 The problem of the lintel in the hall has now been overcome and accepted by the inspector. 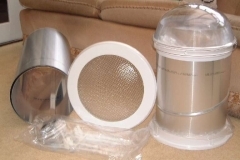 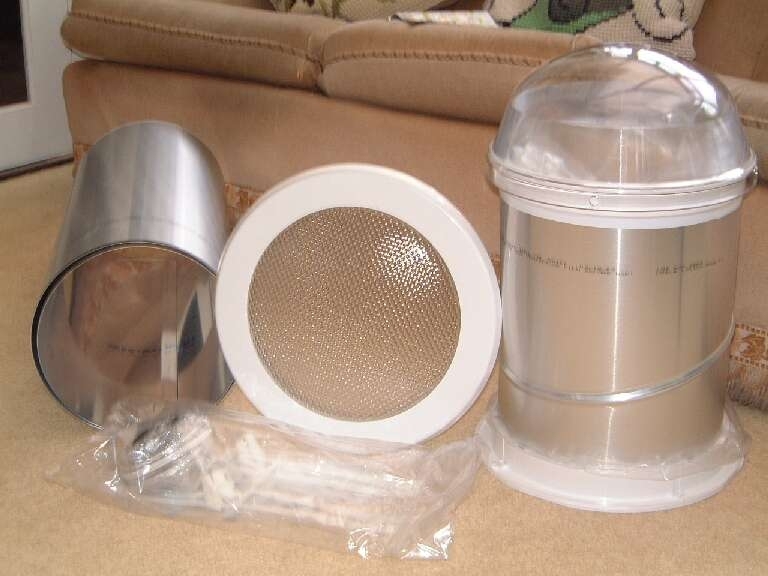 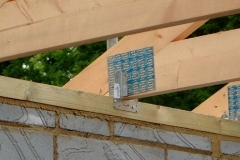 We have decided to put downlighters into the soffit at the front of the house and feel that this will make the building stand out at night. 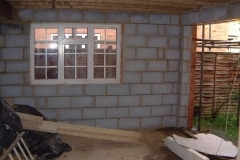 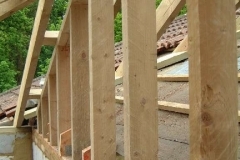 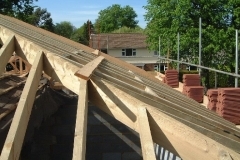 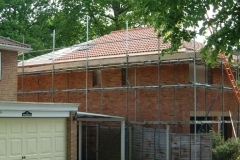 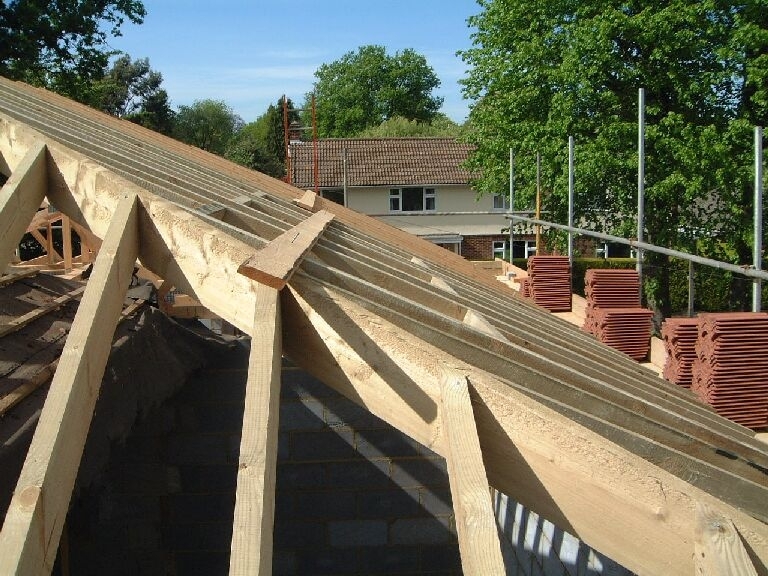 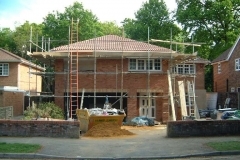 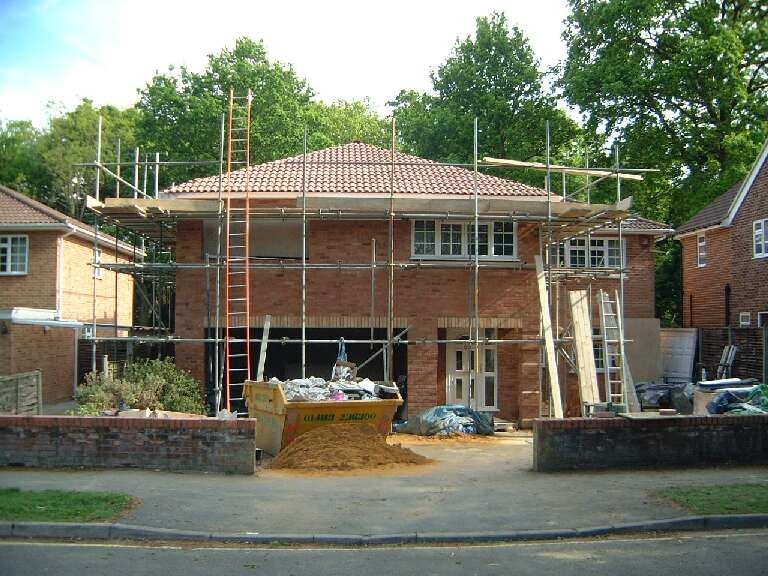 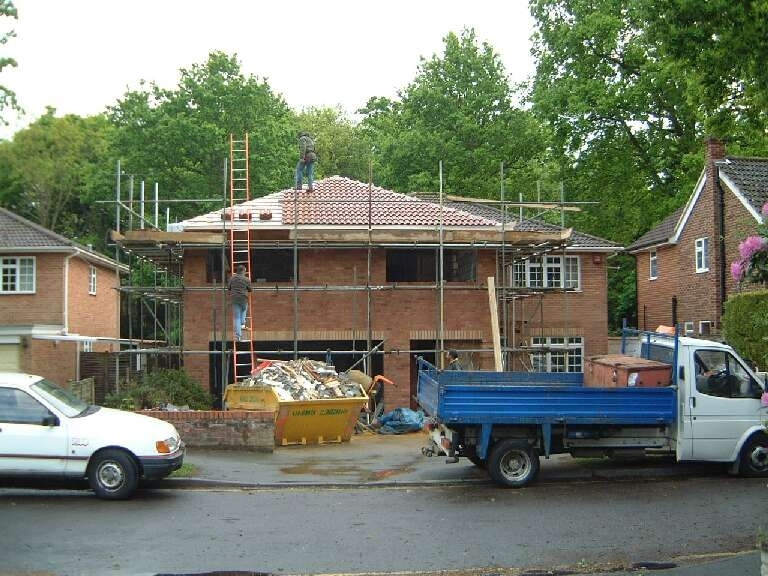 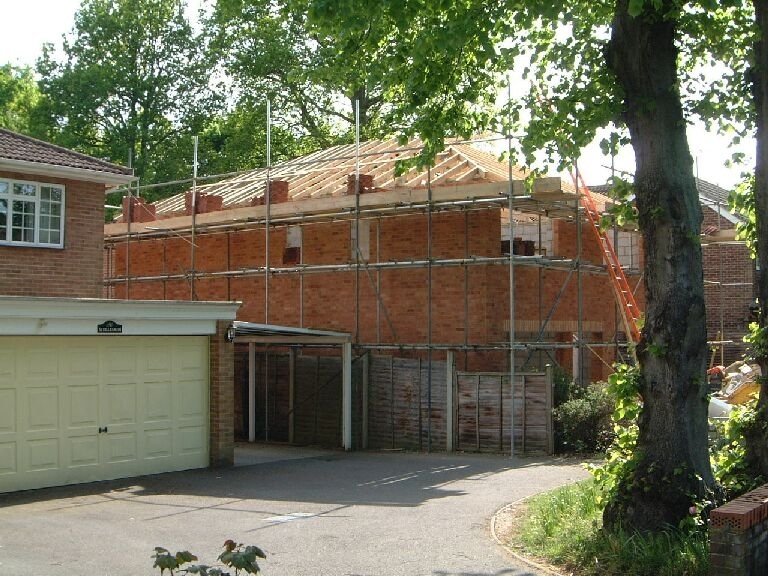 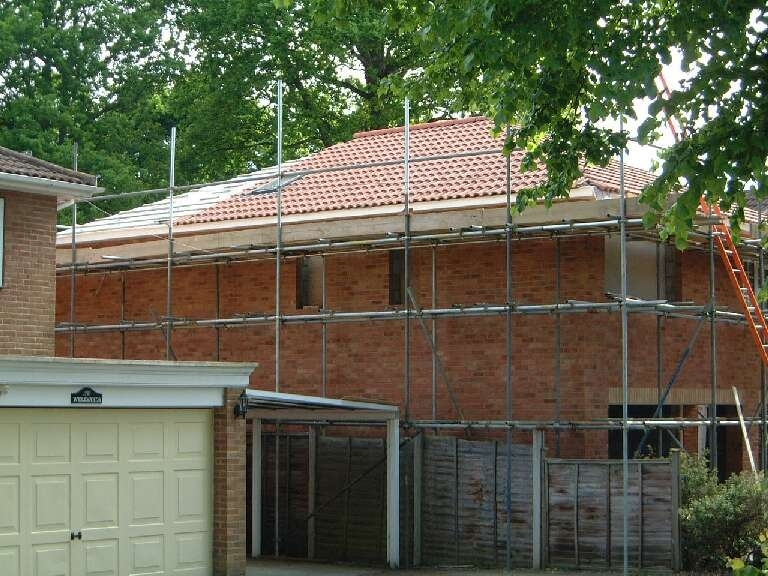 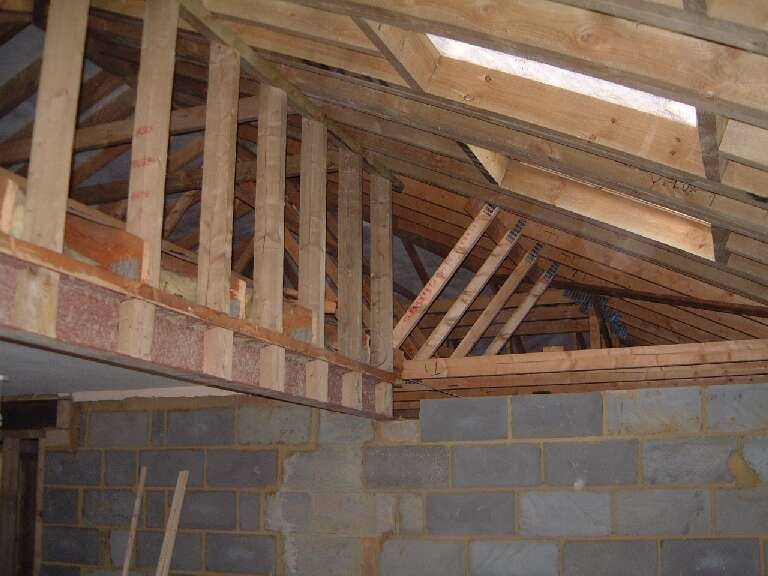 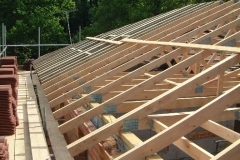 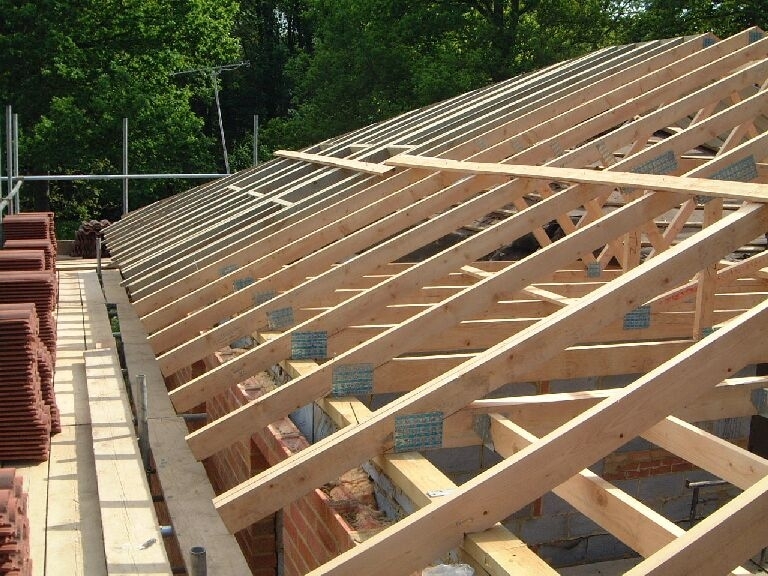 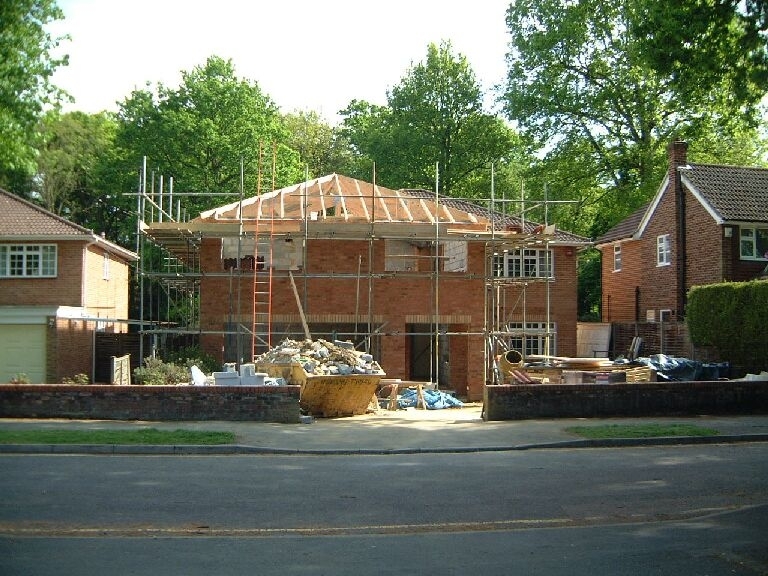 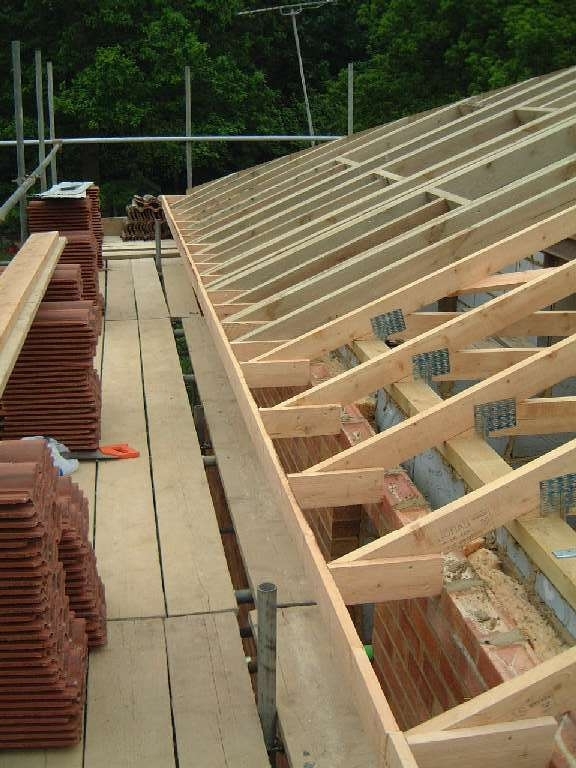 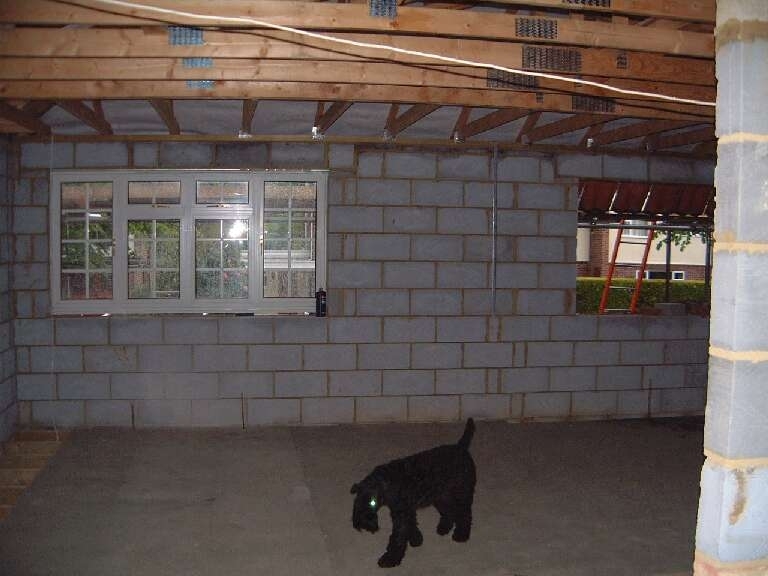 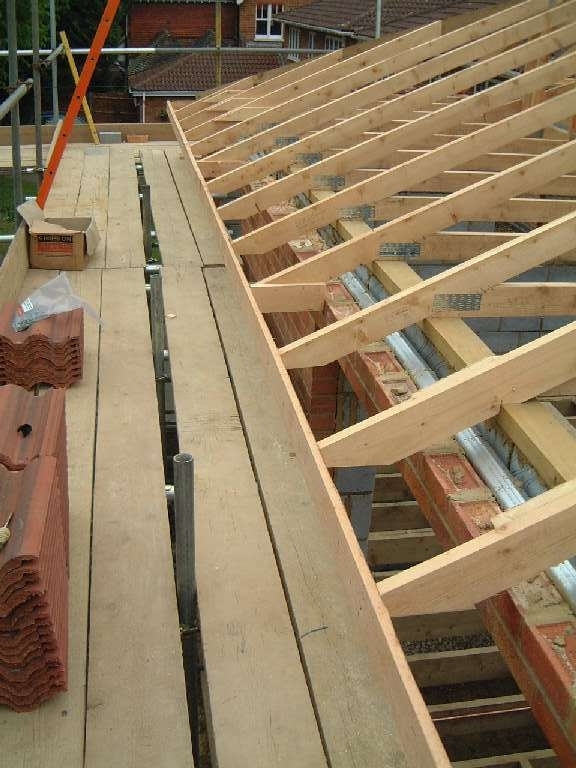 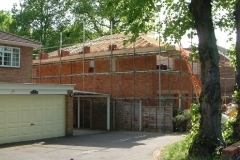 The extra blockwork in the garage was completed and the roof work is almost finished. 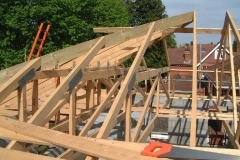 Day 38 – 09-05-03 Warm & sunny. 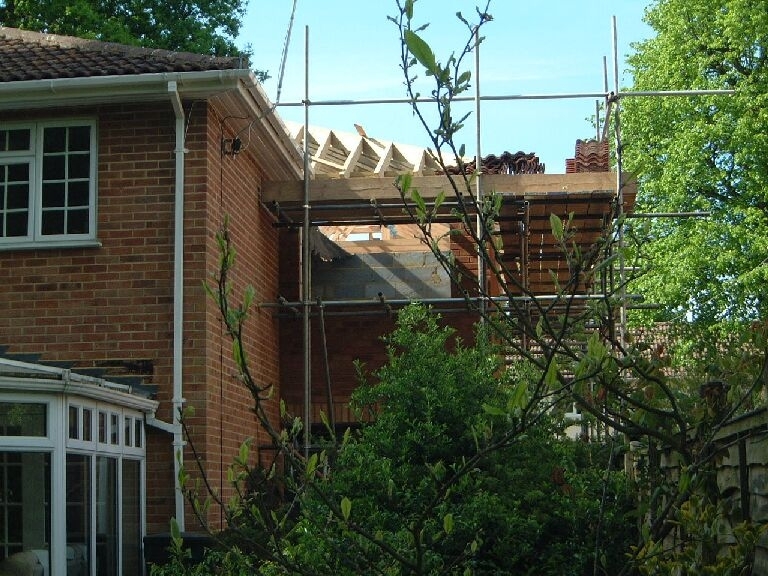 The fascias and soffits were put up by the chippies and look good. 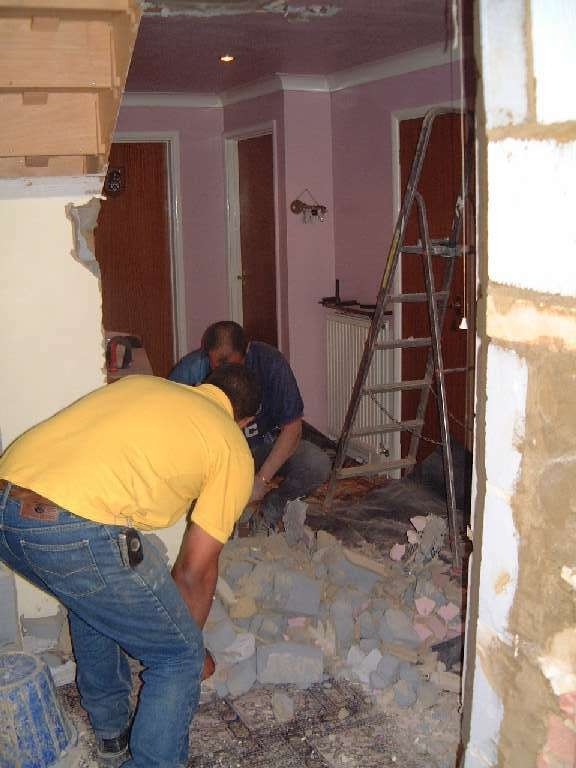 The wall was knocked through for the new hall doorway (slightly larger than planned) and ceiling removed in old downstairs toilet. 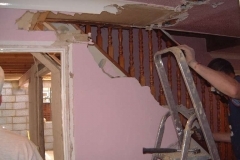 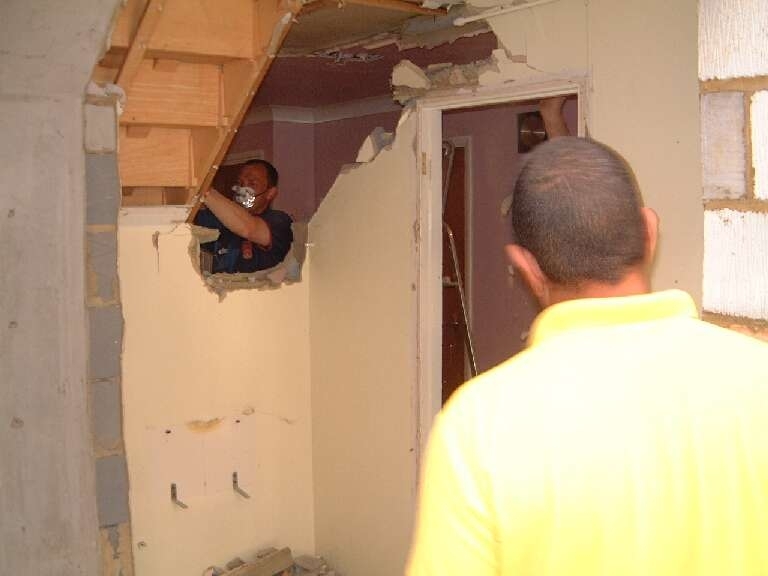 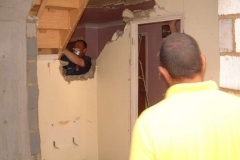 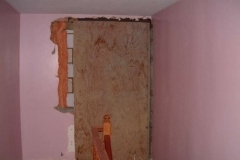 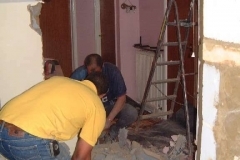 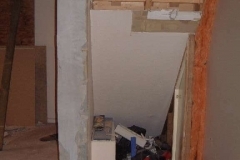 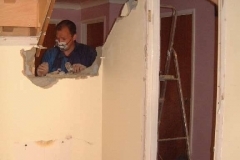 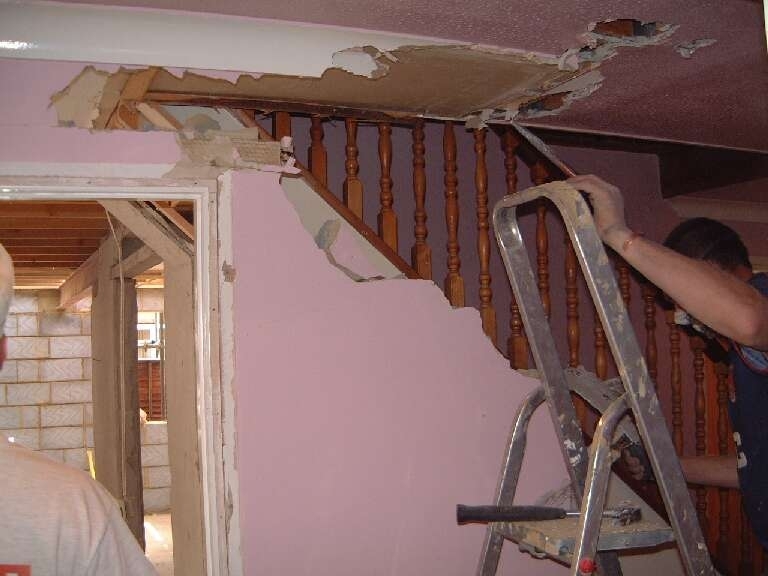 Bill asked if he could knock a hole in the hall ceiling to check joists and as a result decided to demolish the downstairs toilet wall completely. 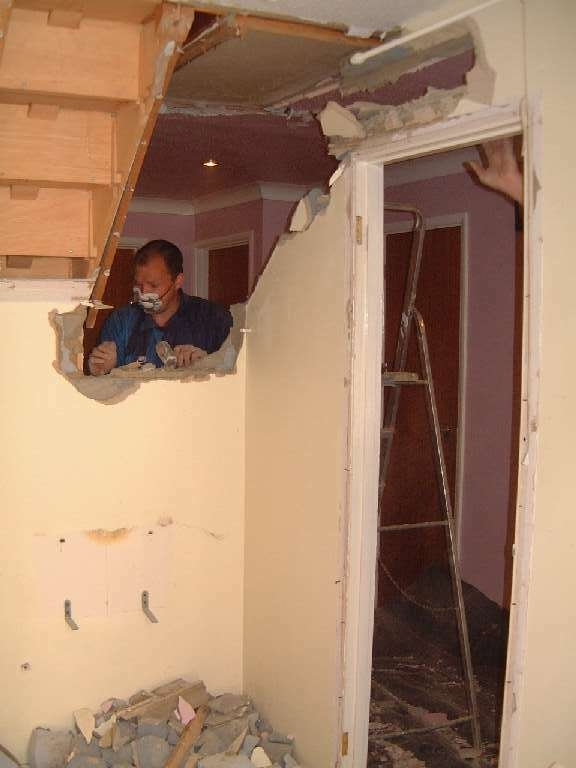 The hole in the ceiling did become rather large however it is being replaced so not really a problem. 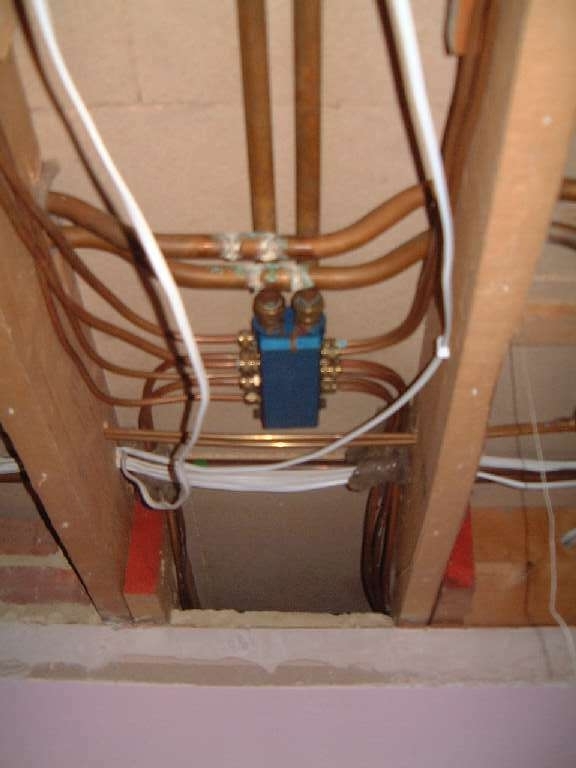 Because the soil vent in the roof was very close to a new gully, Bill replaced the vent with a one way valve in the roof. 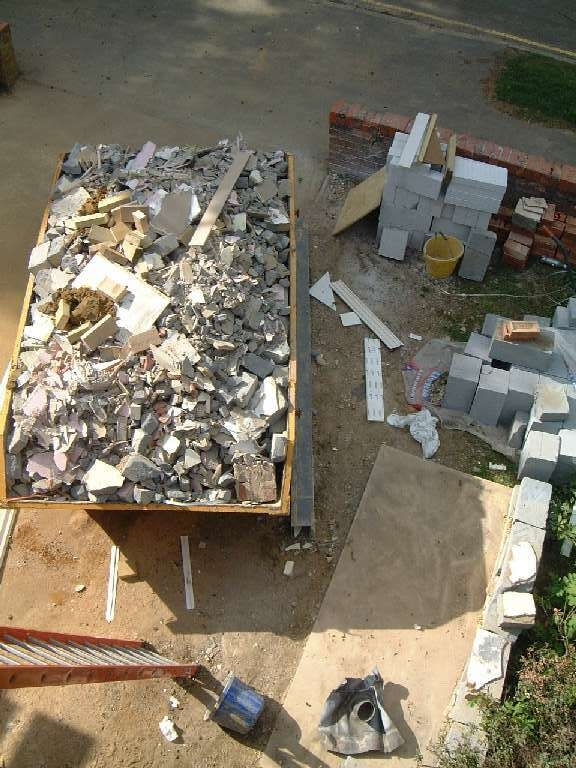 The skip was filled within the day. 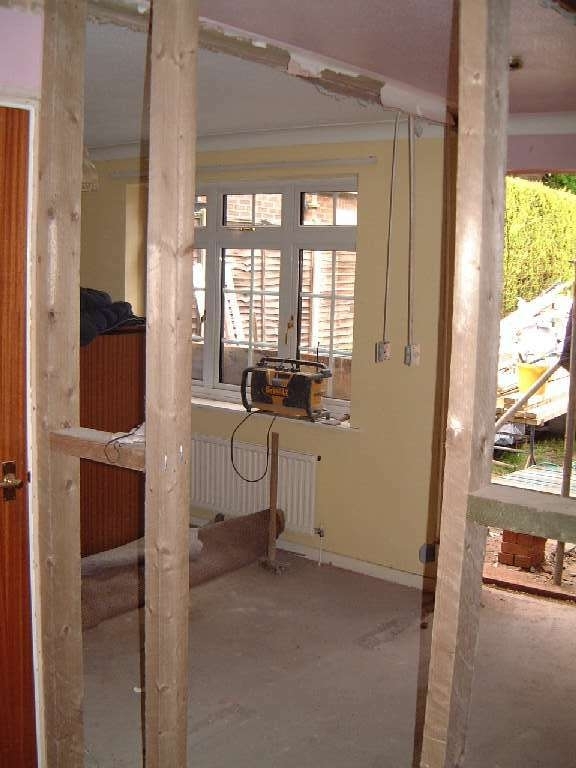 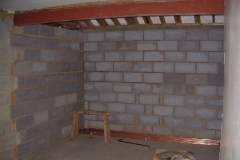 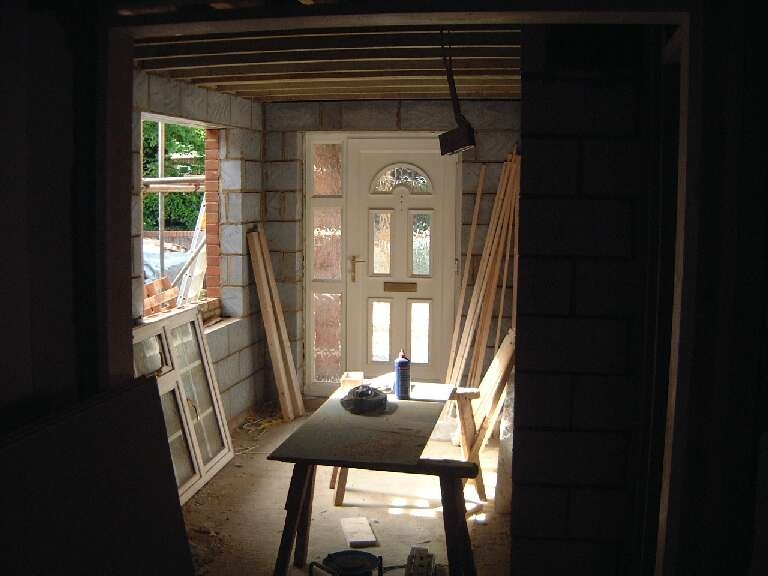 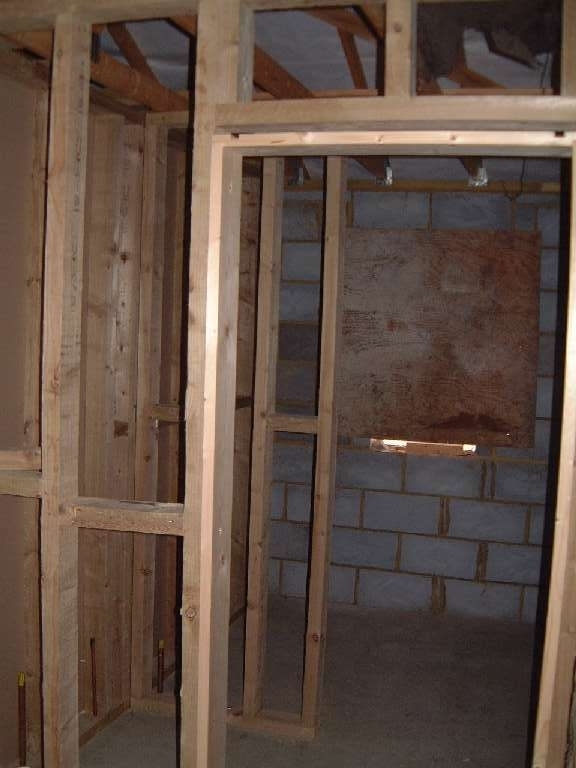 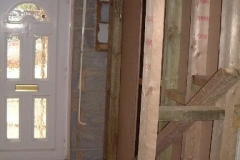 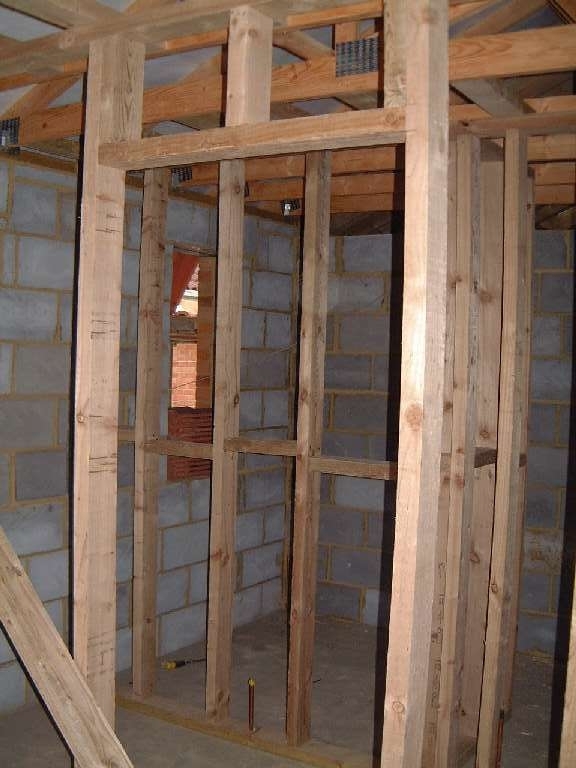 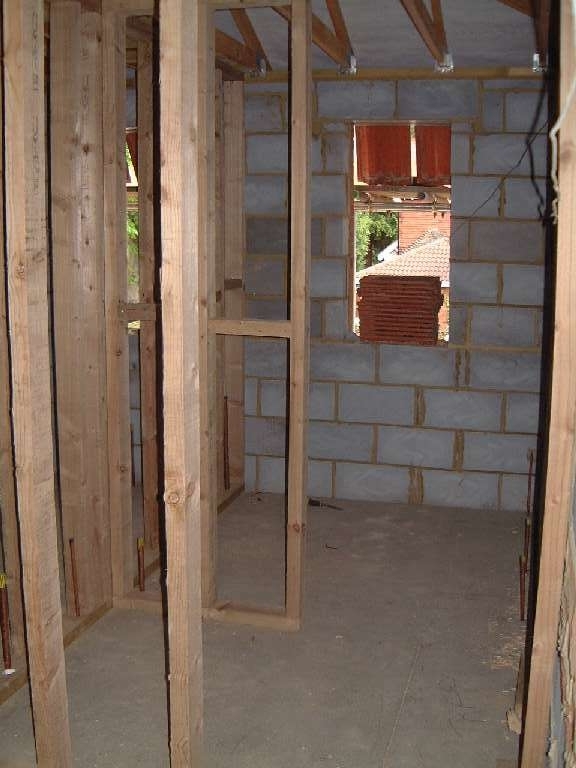 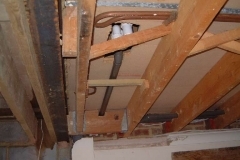 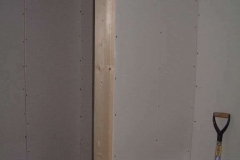 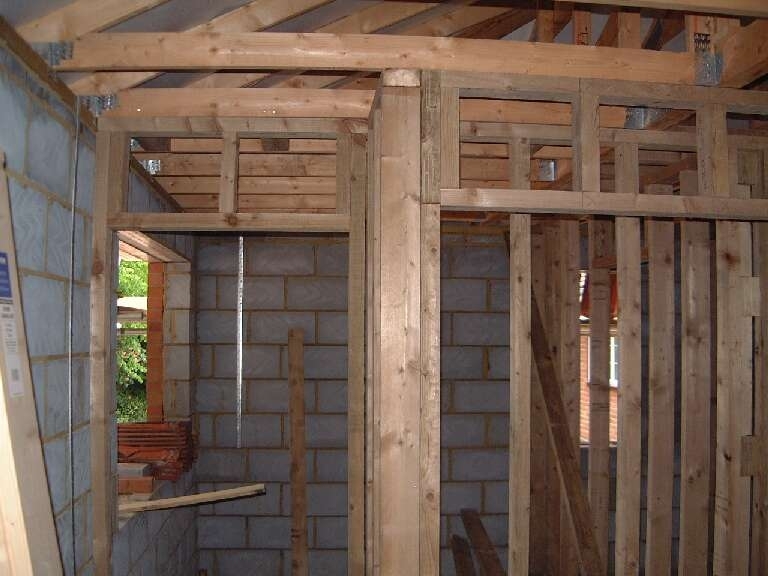 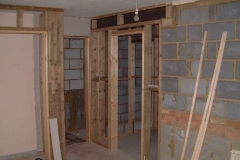 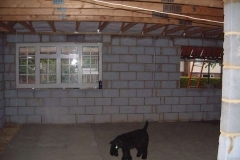 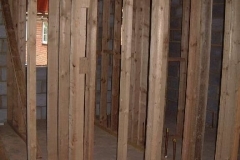 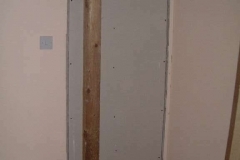 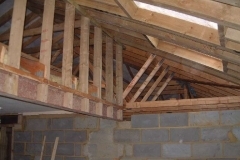 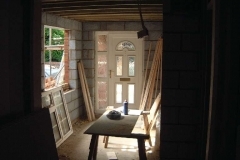 Although not essential the study stud wall was moved to be inline and support a joist, this resulted in the study being about 100mm smaller than the plans, and the new coat cupboard being slightly larger as well as the utility area. 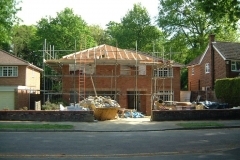 Felt work will start on Monday. 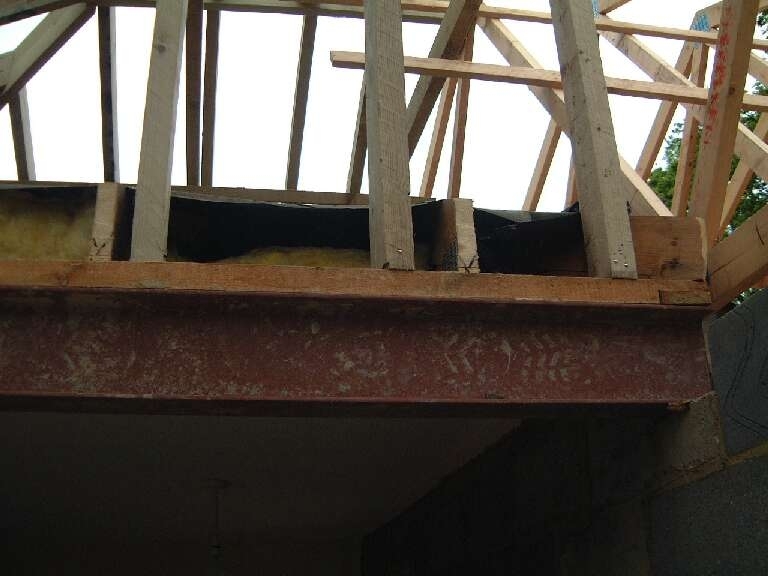 Day 39 – 12-05-03 Heavy showers. 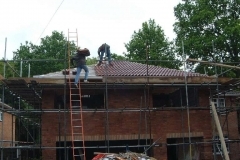 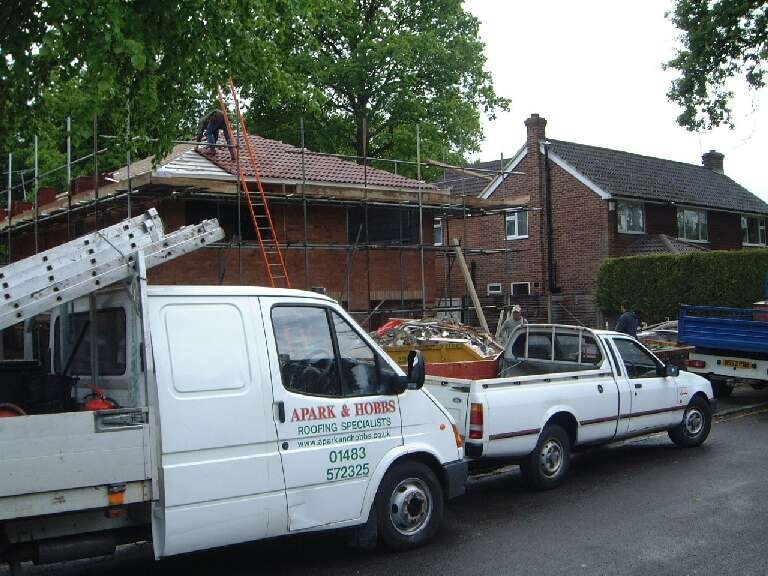 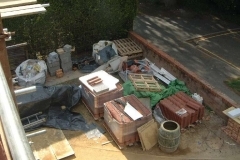 Roofers arrived and progressed well even though it did rain heavily. 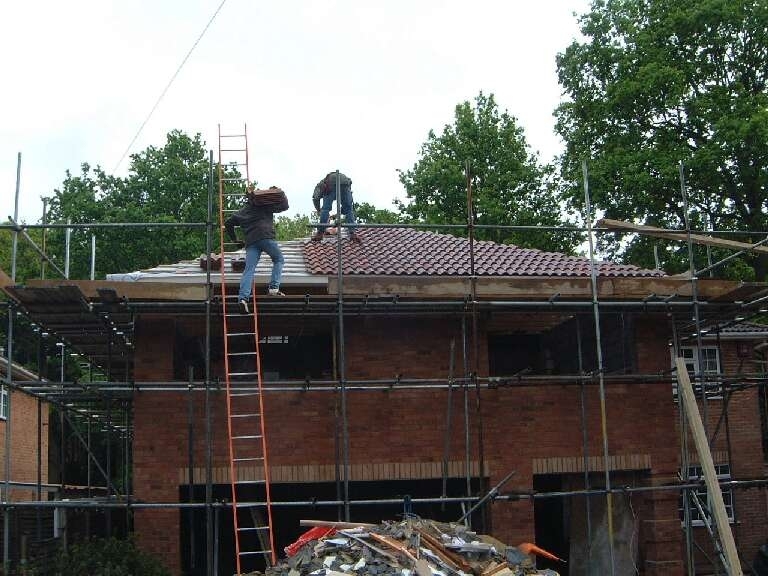 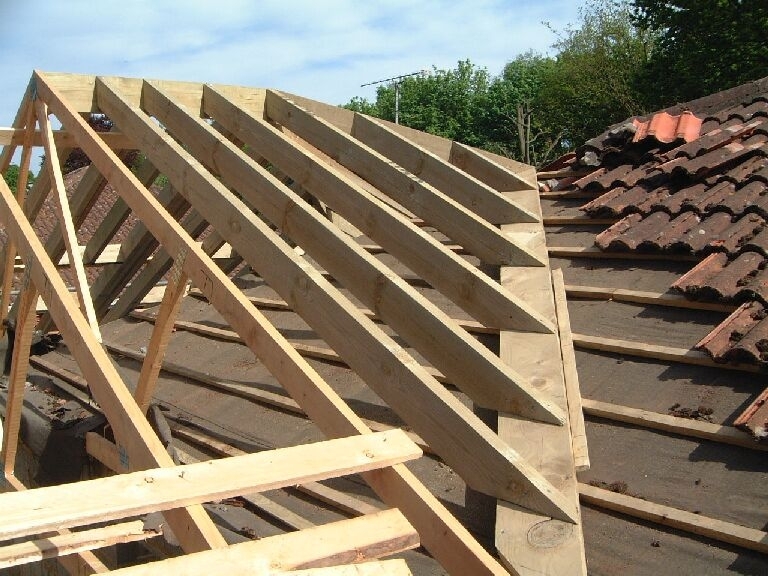 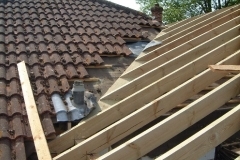 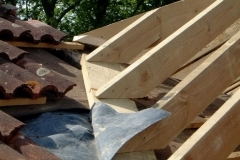 The roofing felt was up and the battons in place shortly after lunch. 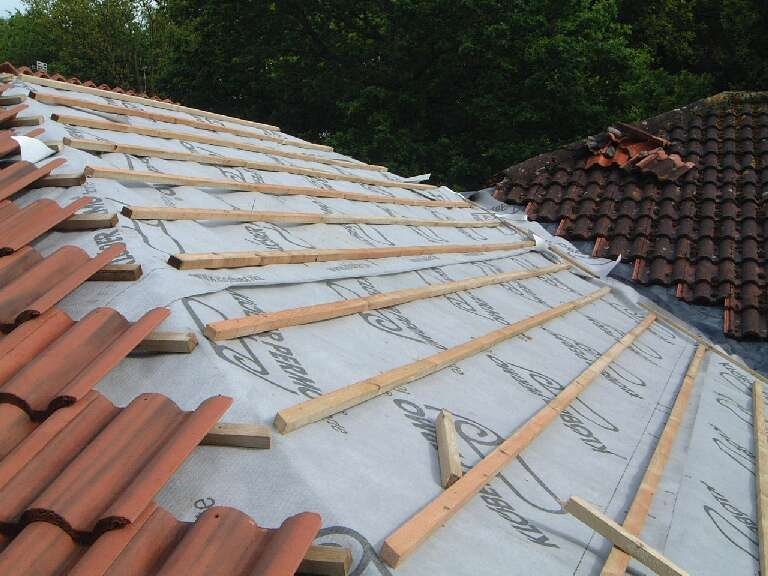 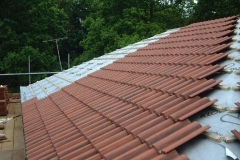 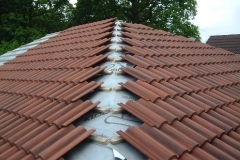 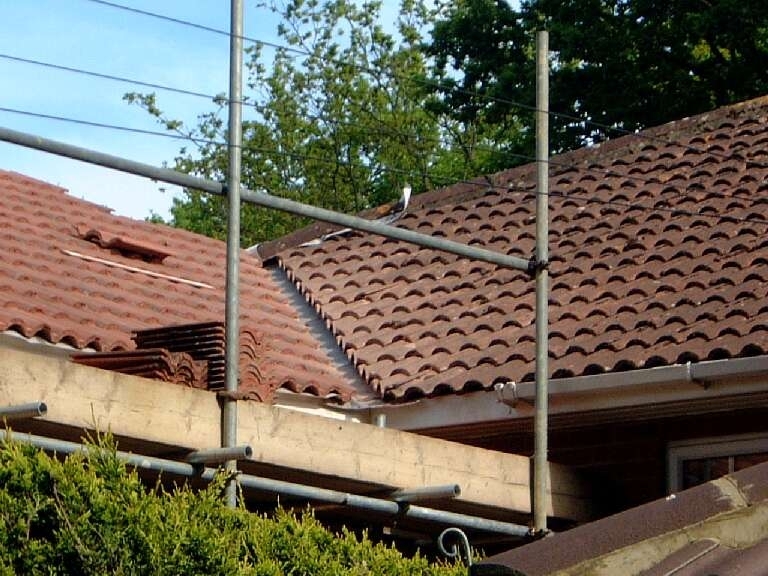 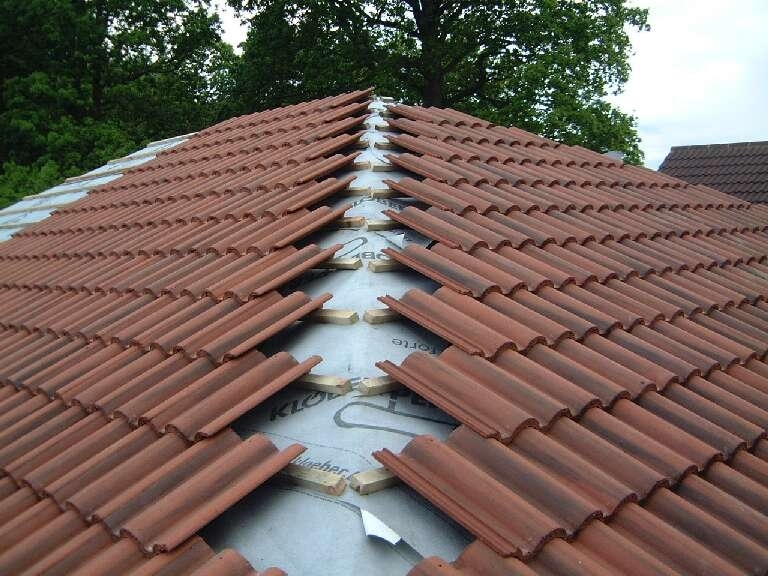 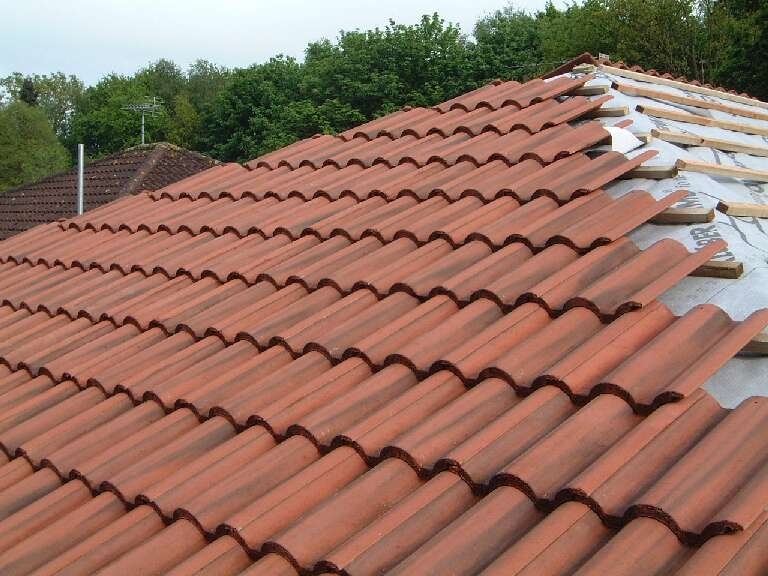 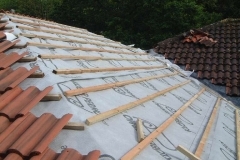 The roofers have managed to put the tiles up at the front and side of the house and during the heavy rain, shaped the lead for the gutters. 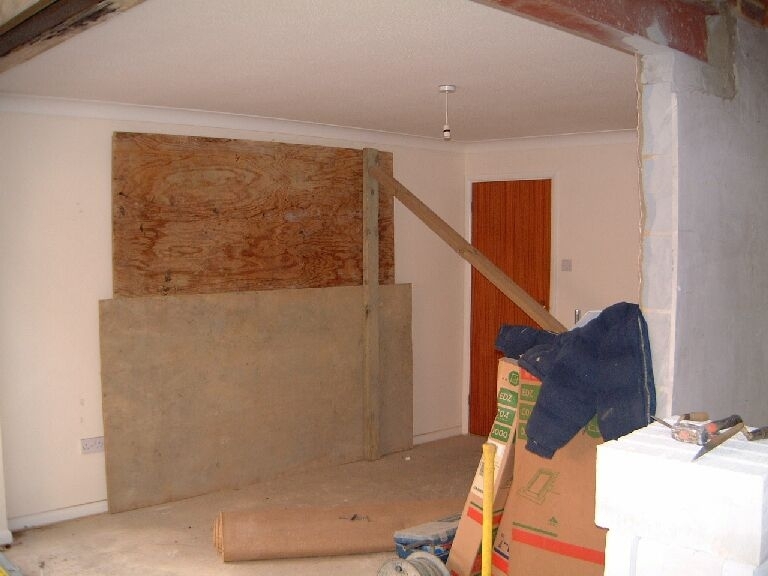 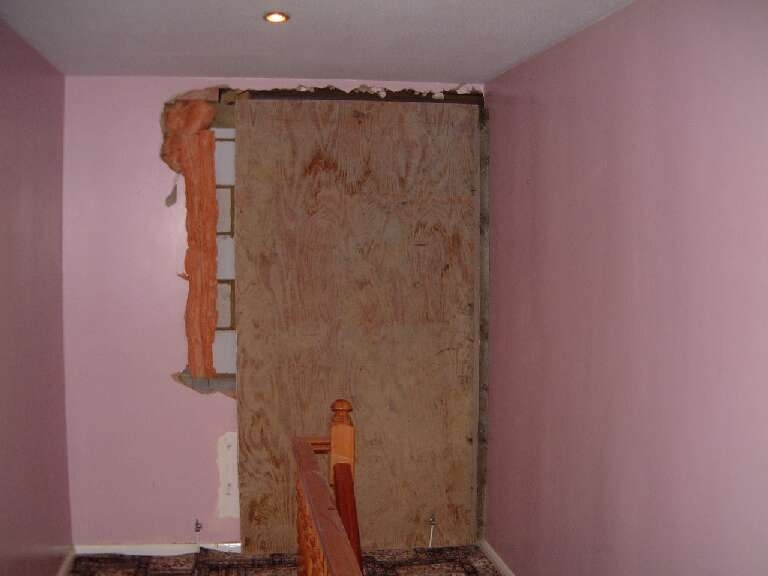 The landing wall was knocked through and Bill then advised us of a further support (not shown on plans) being needed. 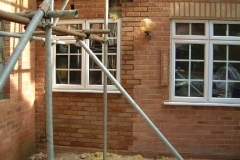 After some discussion it was decided to put a steal over the cut-through. 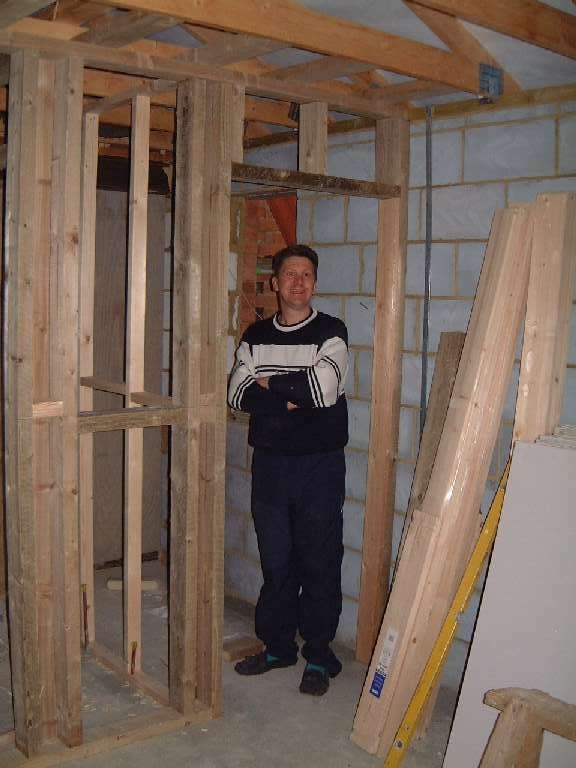 Jim (the architect) came today to do the calculations and after visiting said that he would come round tomorrow to discuss ‘extra work’. 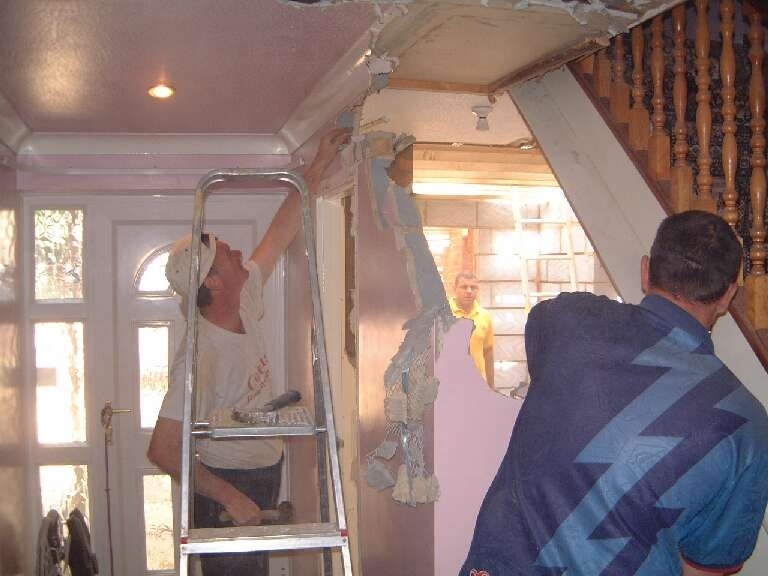 The old dining room ceiling was removed to allow the electricians to do their work (coming on Friday). Day 40 – 13-05-03 Thunder, hail & torrential rain, thank goodness we have the roofing felt in place otherwise we would have been soaked. 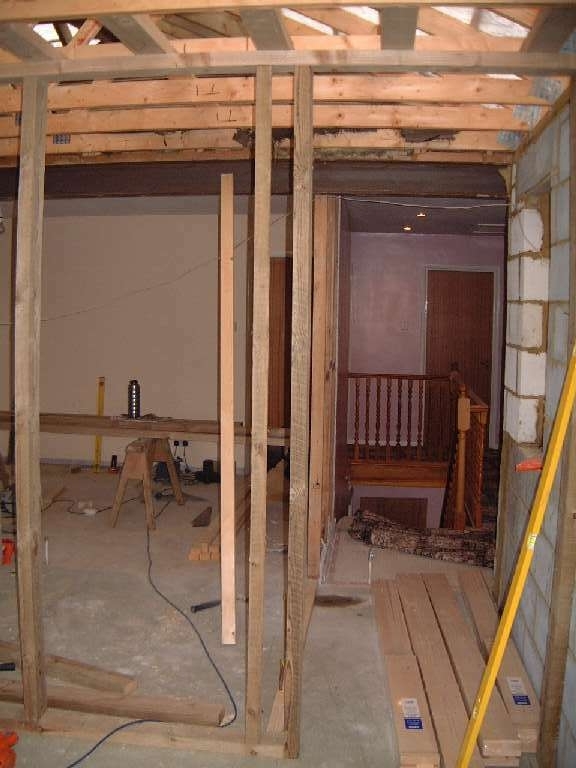 Morning started with the window being put into the dining room and the front door being removed and placed in its final position. 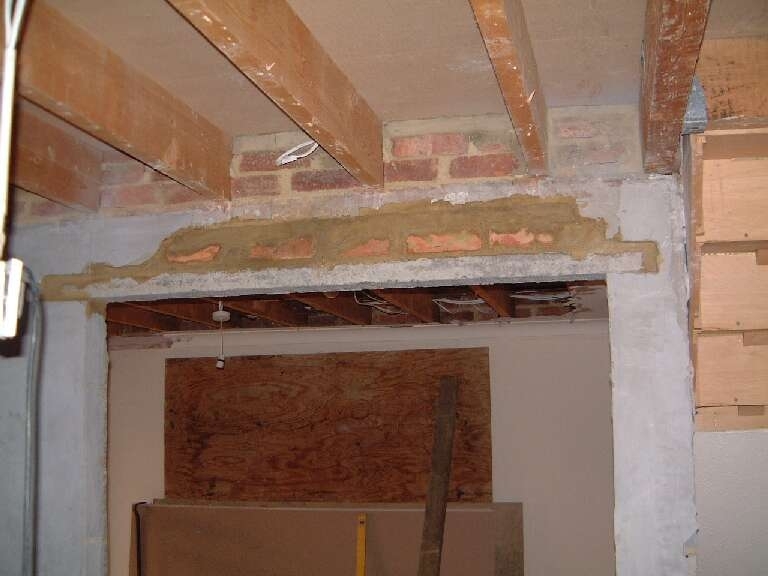 Bill used the cutter to cut the bricks in the old doorway. 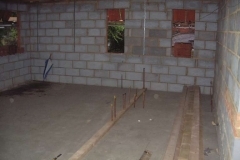 The chippies got on and almost completed the laying of the floor (ran out of flooring). 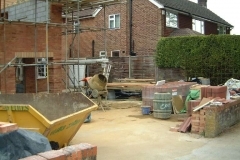 Although it was very hectic in the morning we were left with just the chippies in the afternoon. 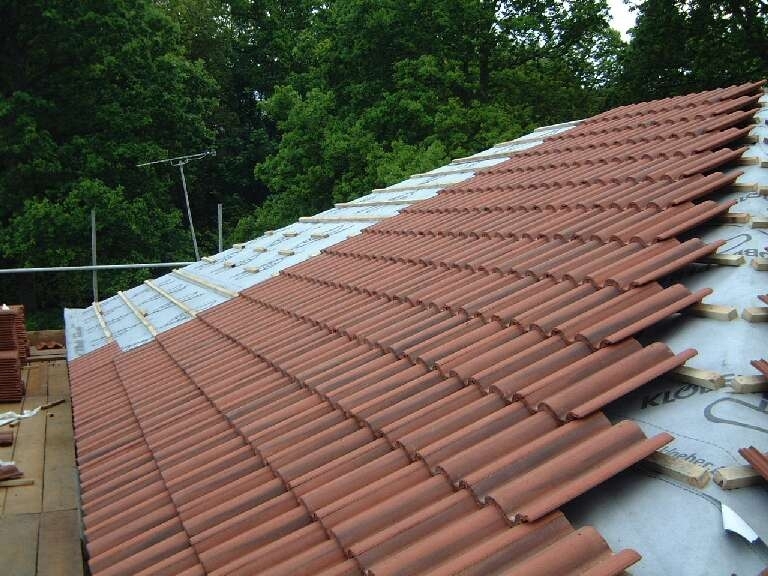 It would have been much better for the roofers to be here to complete the tiling. 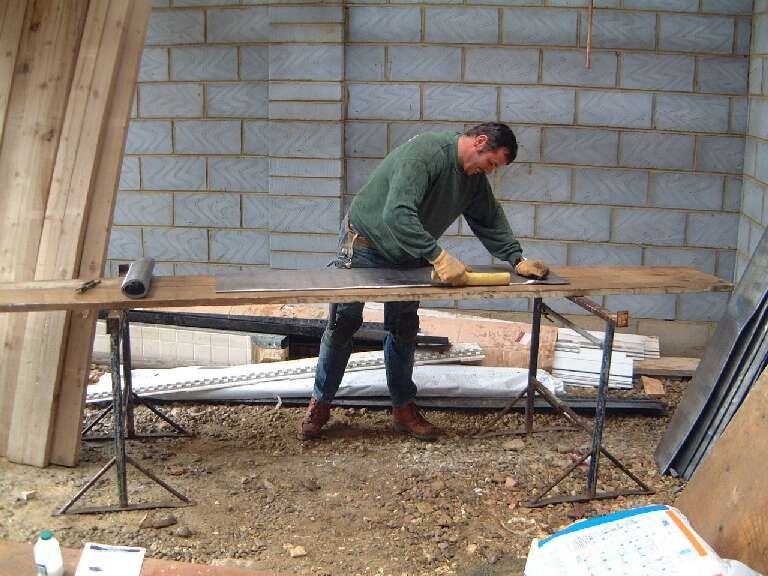 Day 41 – 14-05-03 Slight showers. 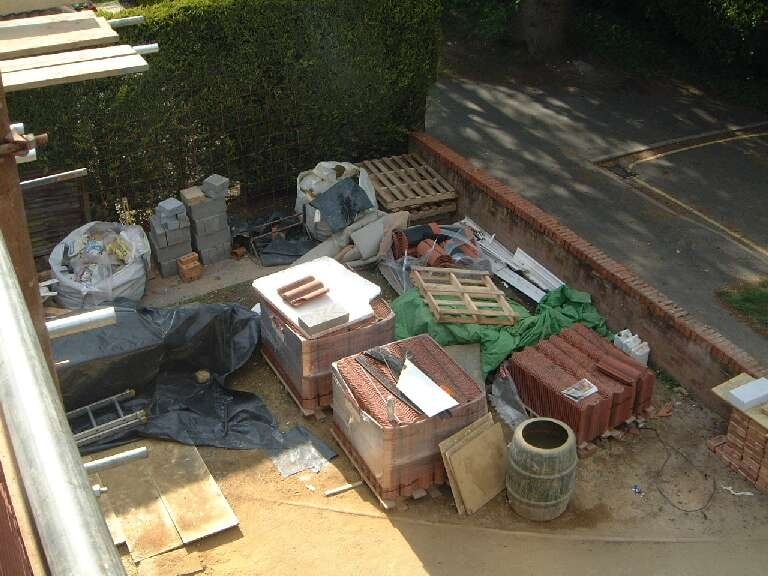 Today had 9 people (4 builders, 3 chippies and 2 roofers). 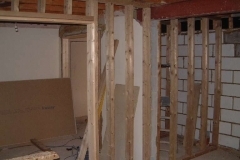 We went from a very open space to lots of boxes being formed by the studwork. 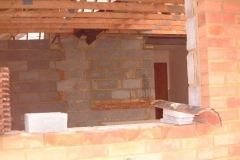 The wall was built up where the old front door was using old bricks. 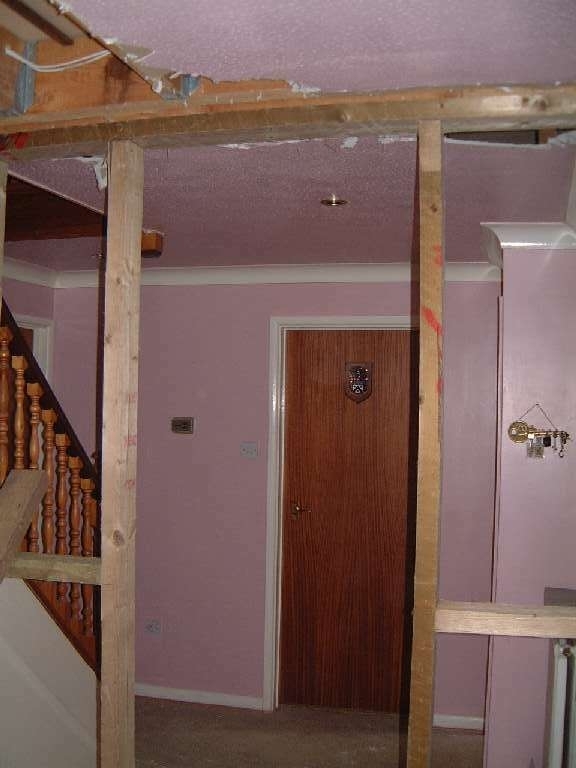 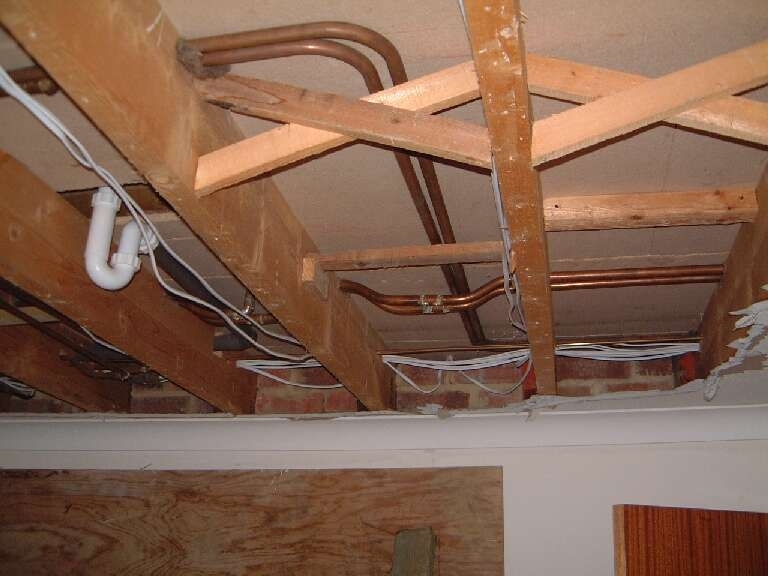 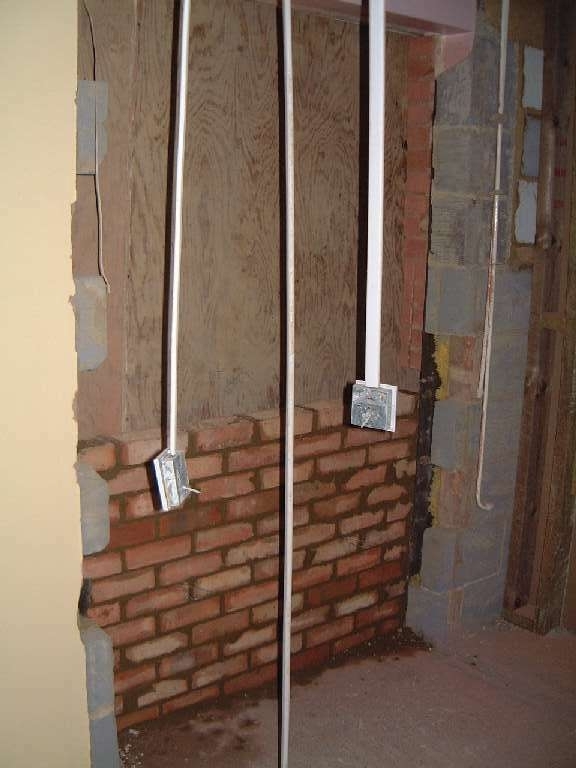 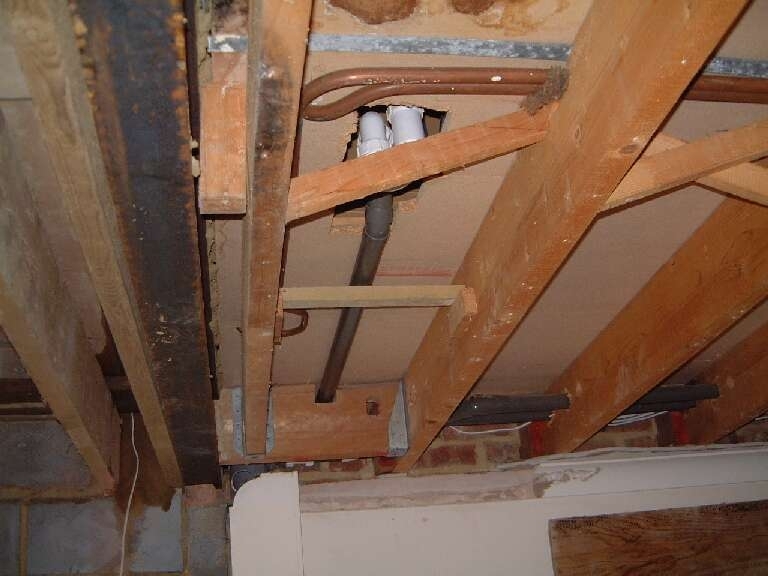 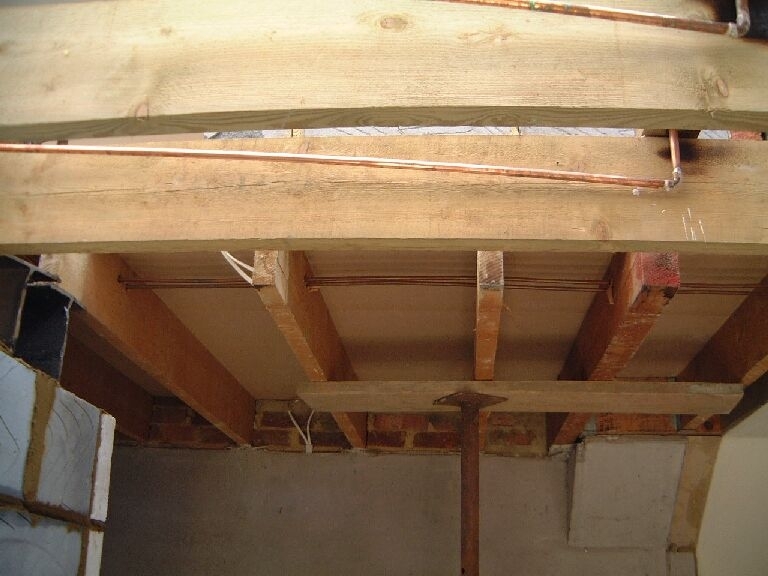 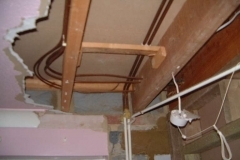 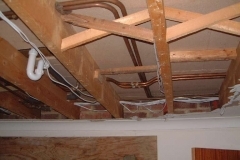 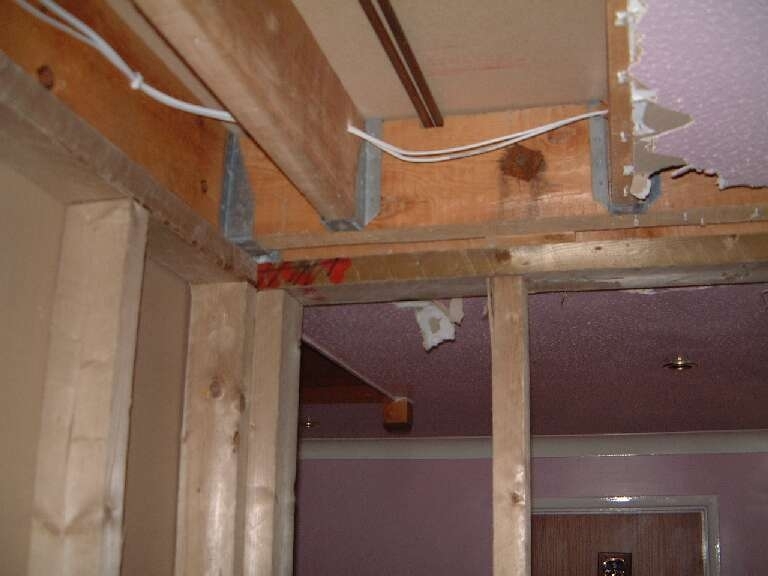 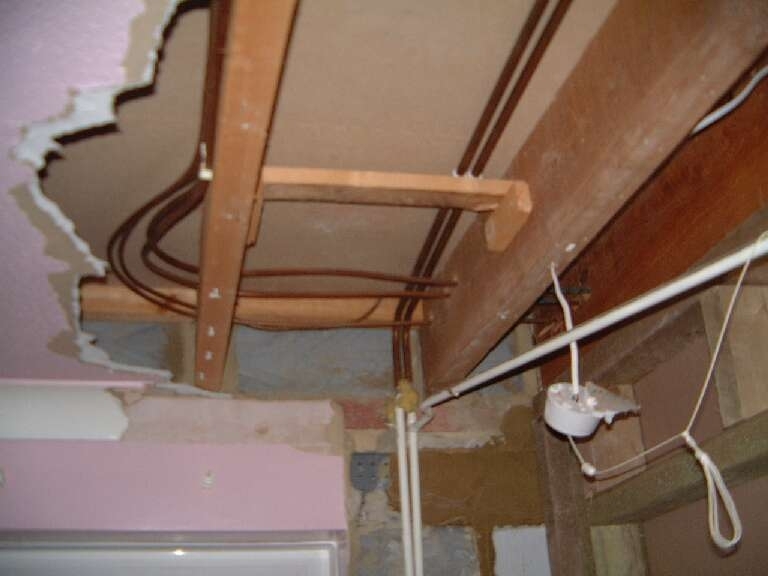 The hall ceiling was removed revealing the manifold microbore and 2 convertors close to the lounge door. 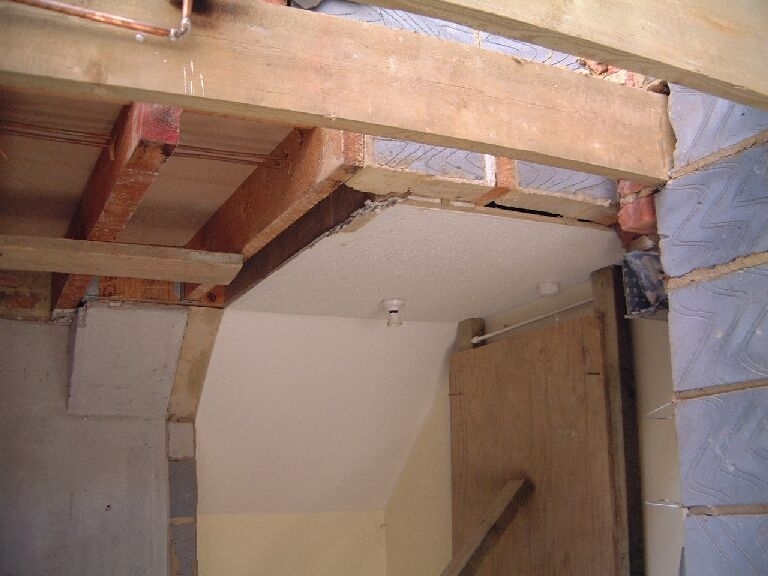 Part of the study ceiling was removed as well as the old hall wall opening creating the full study size. 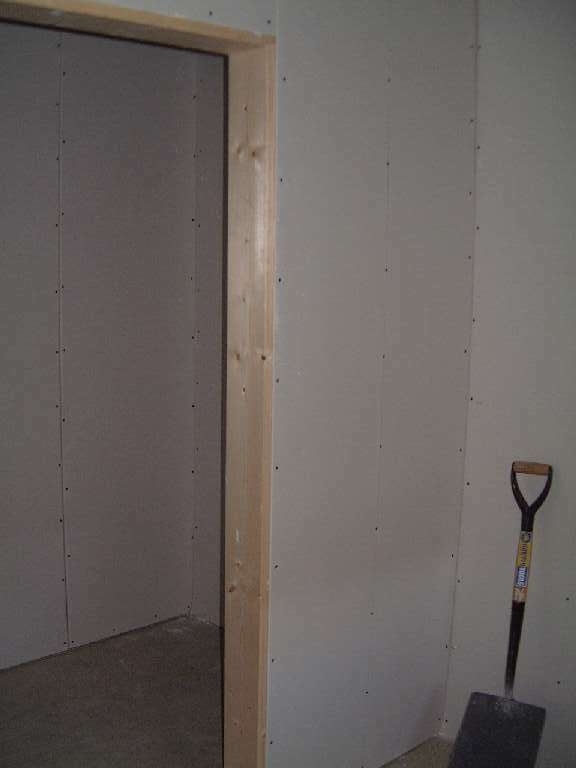 We arranged with the chippies to make the fitted wardrobes. 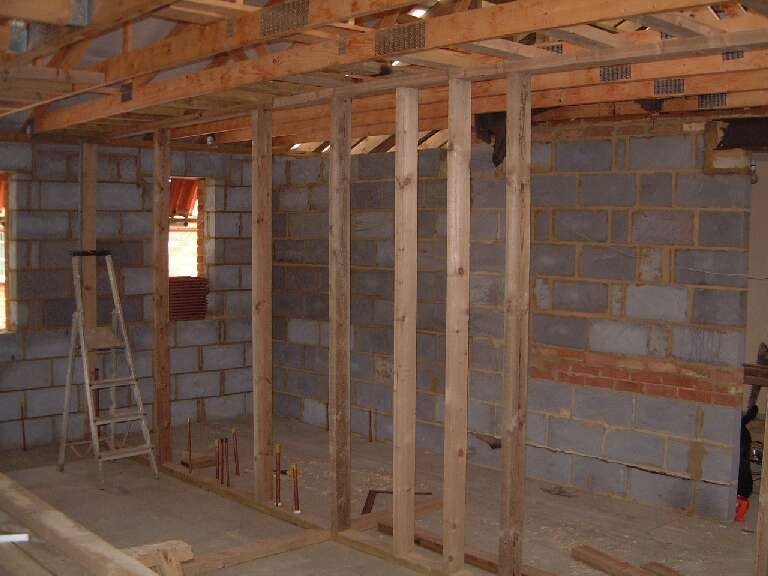 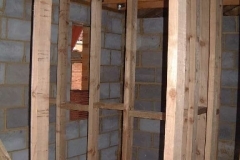 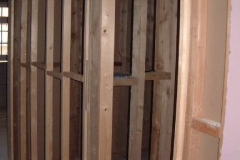 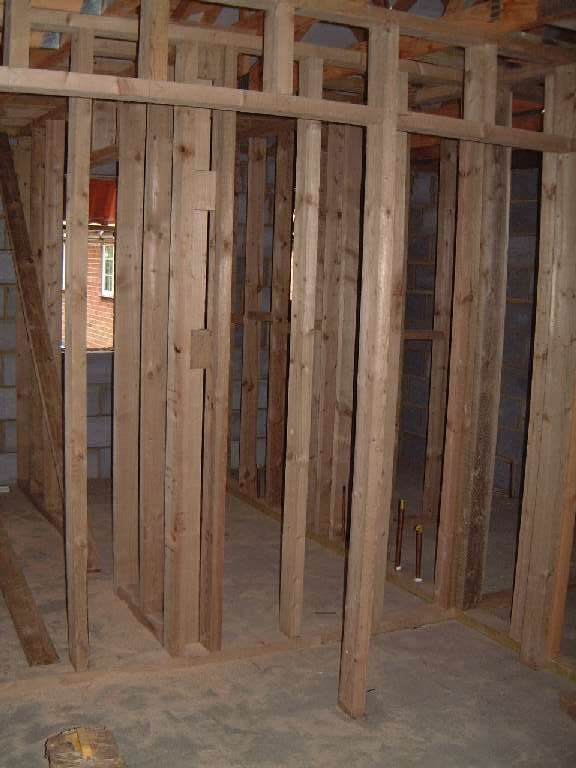 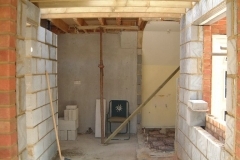 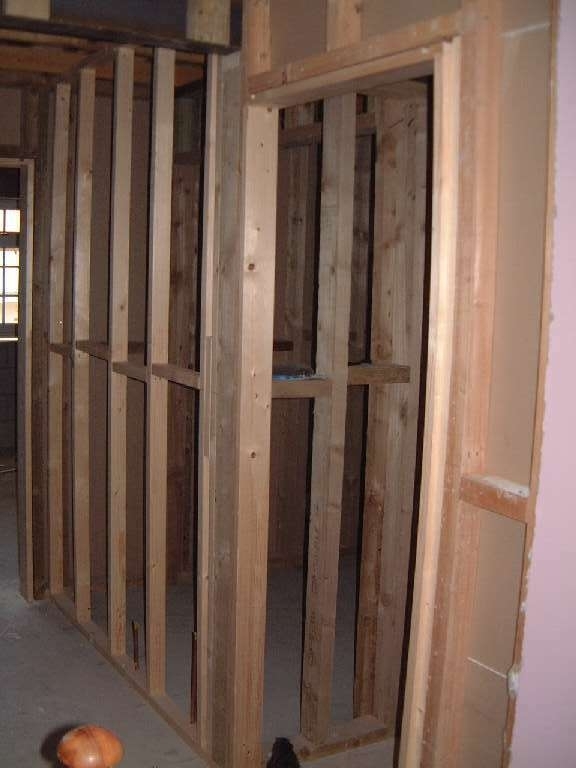 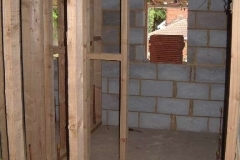 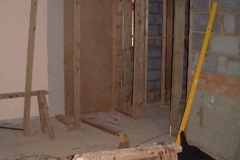 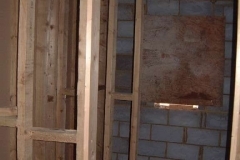 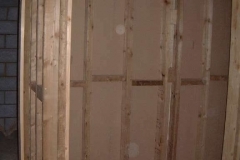 The stud walls are progressing well and the chippies have also left 3 ‘traps’ so that the plumber can complete his work (no drains have been put in place). 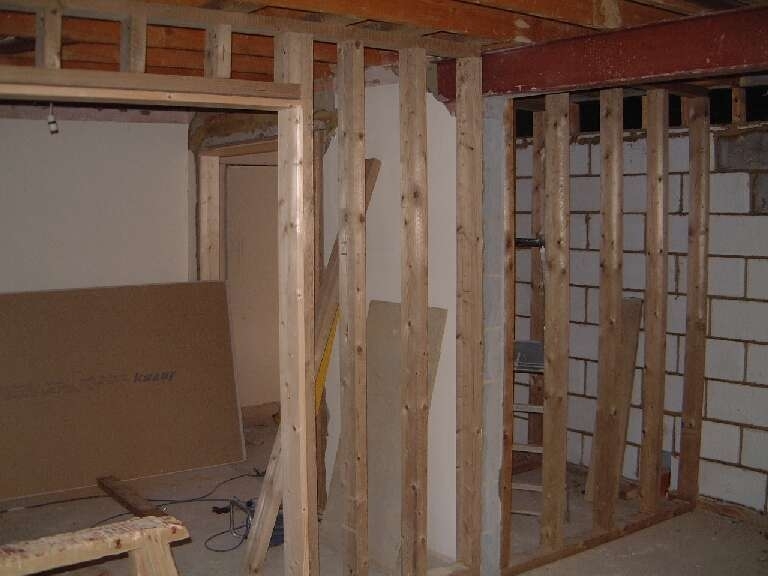 Day 42 – 15-05-03 Dry. 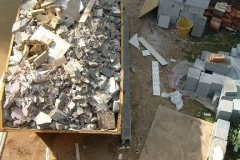 Morning once again hectic. 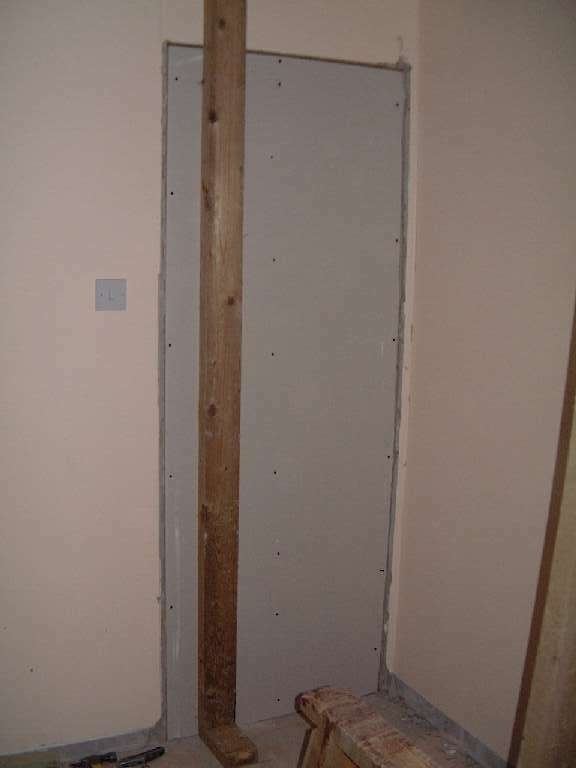 Stud walls upstairs finished and plaster board being applied as well as one ceiling. 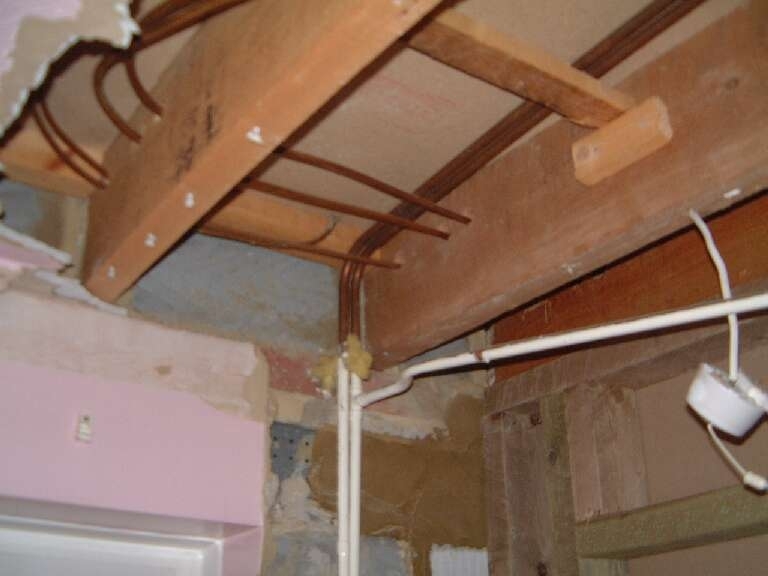 Minor problem with Master shower stud work which Ed rectified without problems. 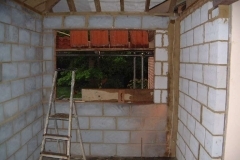 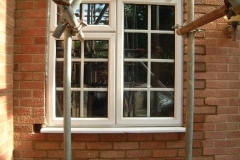 The new study window was put in place using old bricks and the glazed panels were put into the door. 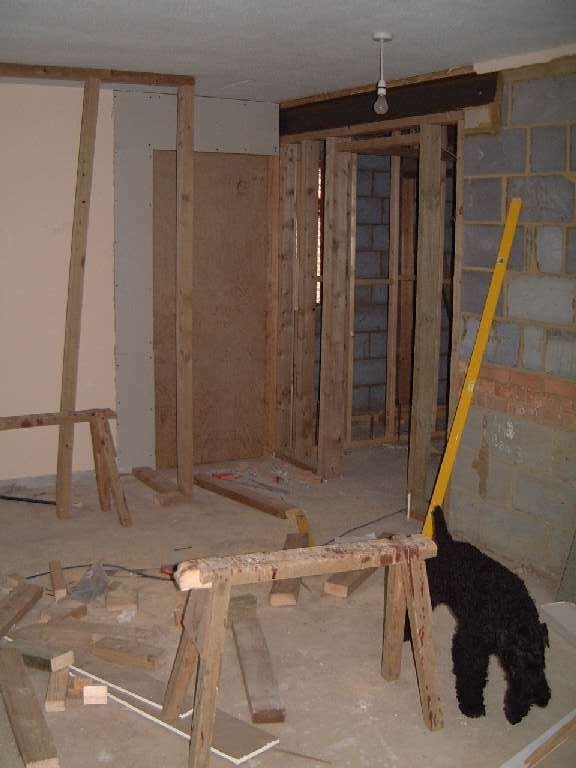 Discussion with Ed (the chippie) about banister resulted in keeping our existing and not opening the stairs into the hall – this does make the building work easier, but will make the hall slightly darker. 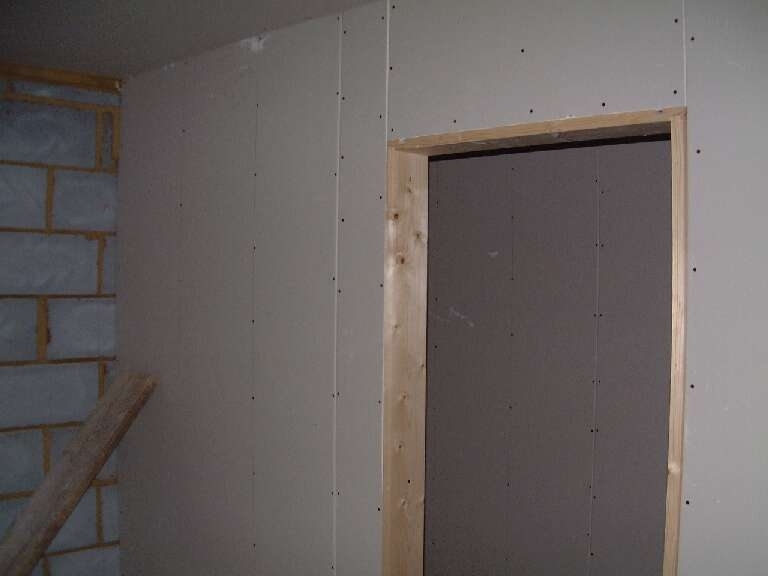 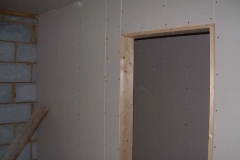 Door frames were put in place upstairs and also studwork started downstairs. 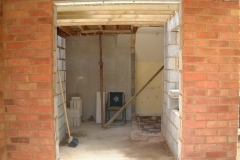 We are now having glazed double doors between the hall and dining room to ‘borrow’ light into the hall. 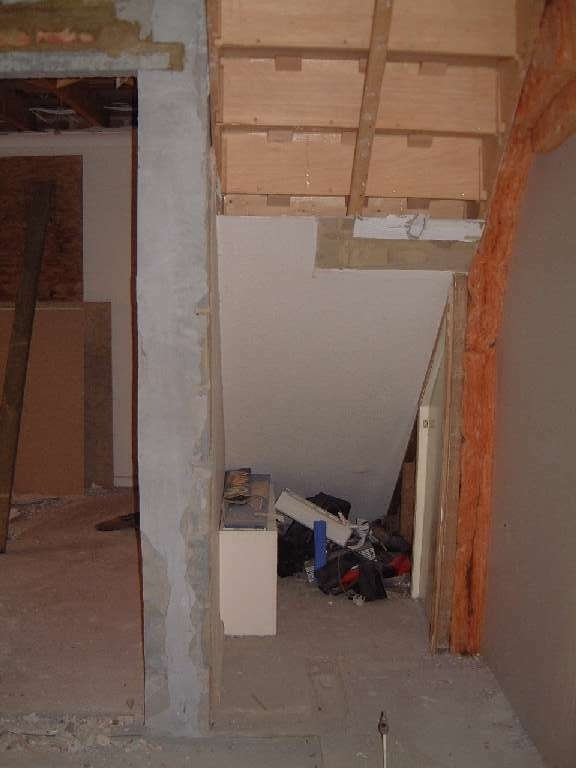 Jim the architect called round to take notes of load bearing walls and also the cathedral ceiling for the building inspector. 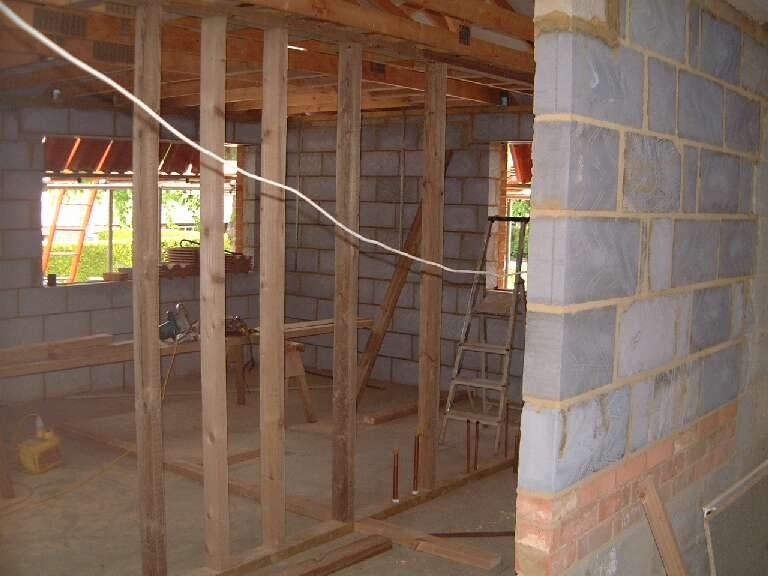 The house is taking shape.